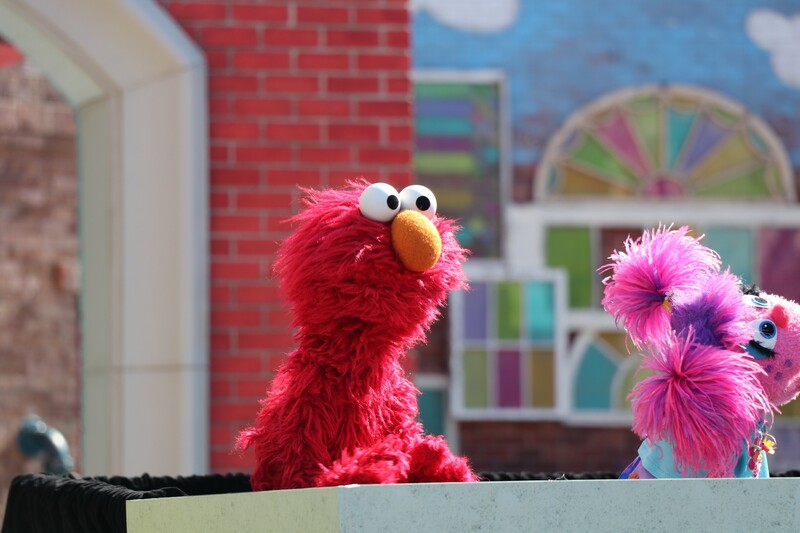 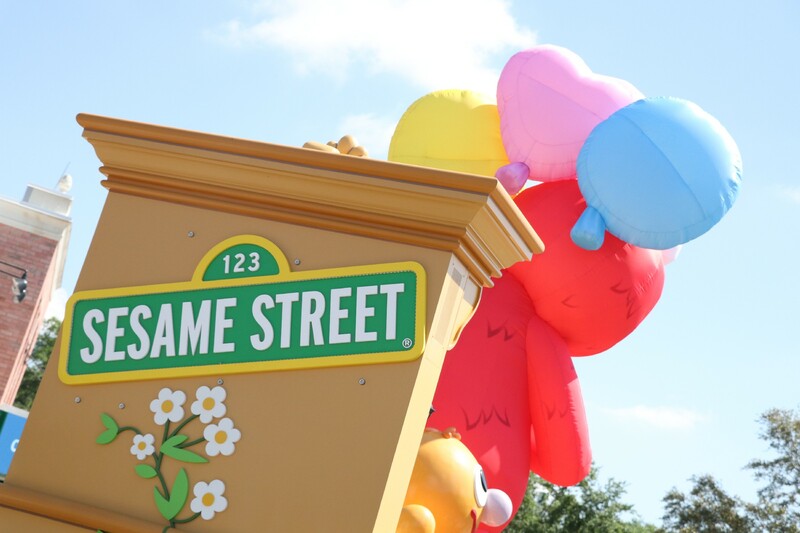 The world of Sesame Street comes to life as the new land has officially opened at SeaWorld Orlando. 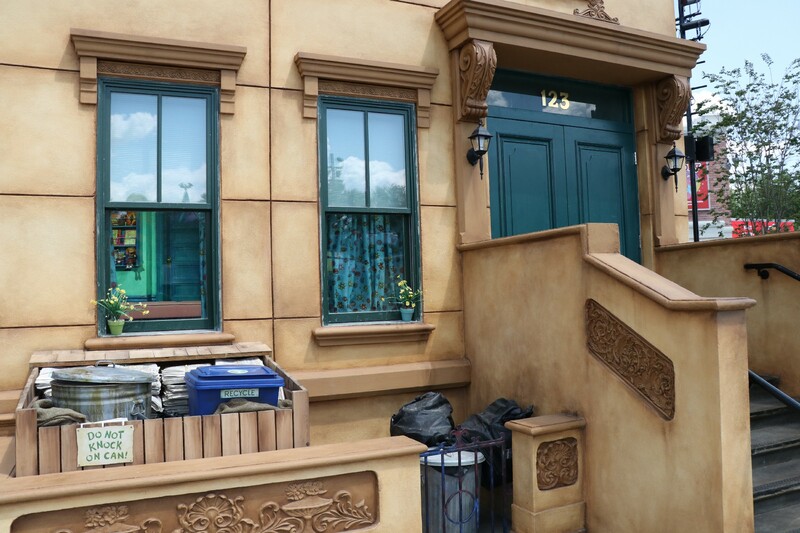 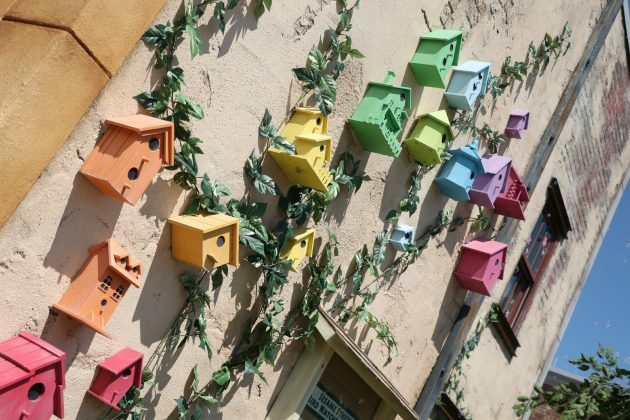 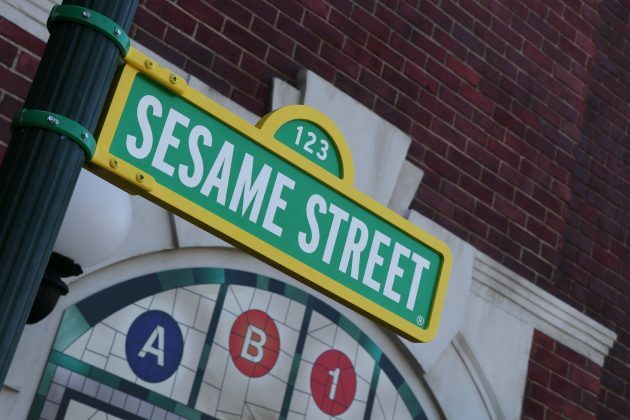 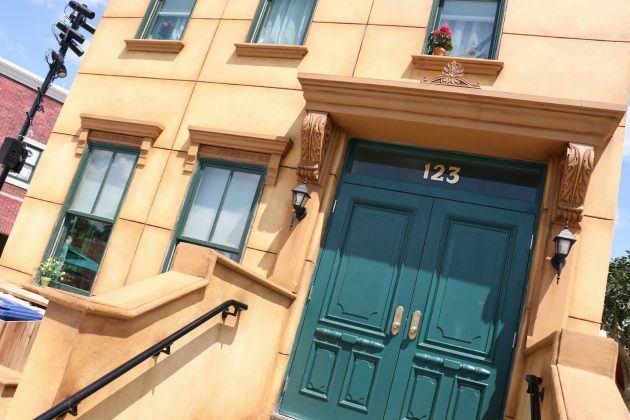 The land features the iconic Sesame Street neighborhood including Abby Cadabby’s Garden, Big Bird’s Nest, Mr. Hooper’s Store, and the famous 123 Stoop. 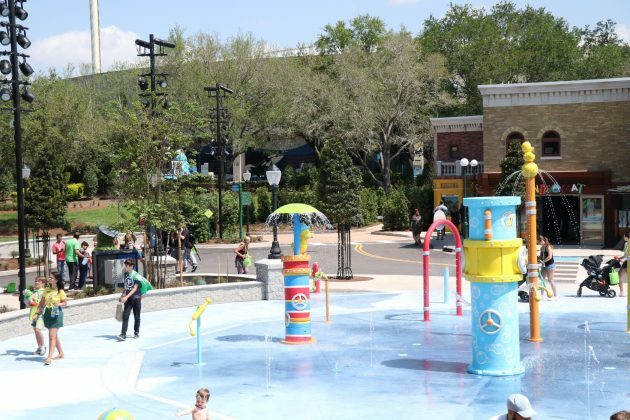 SeaWorld was kind enough to invite us out during the Media Preview of the land, and we must say, hands down, is their best, and smartest addition in the history of SeaWorld Orlando. 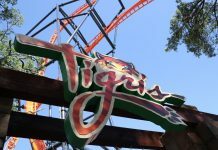 While there are definitely some issues, which we’ll get into later, the area brings something that SeaWorld has been severely lacking – a recognizable intellectual property. 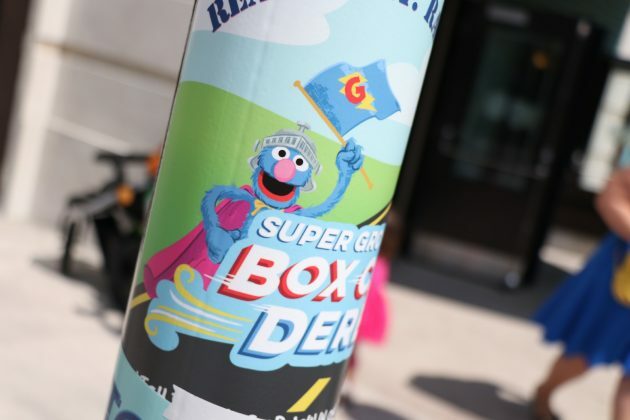 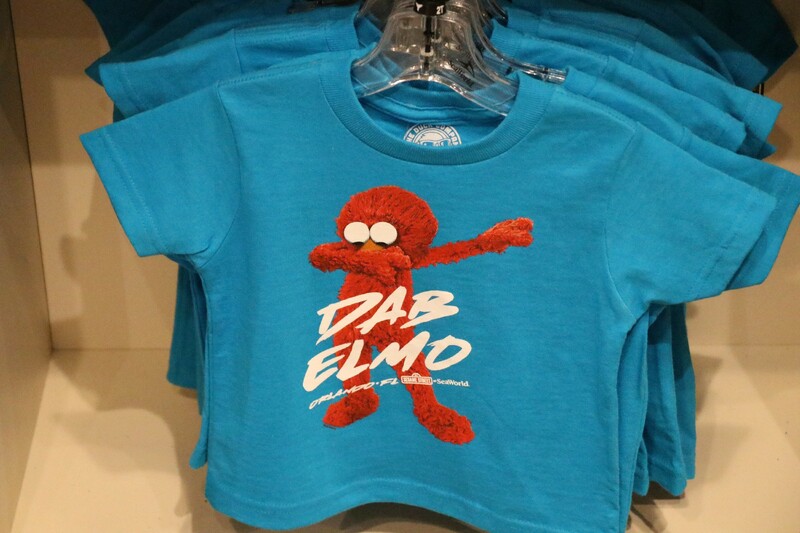 Sesame Street is a beloved children’s show – known for its “edutainment” values and introducing the world to iconic characters like Big Bird, Elmo, Cookie Monster, The Count, and more. 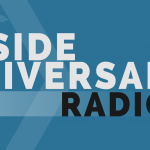 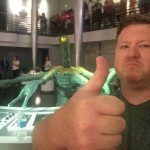 The show is celebrating its 50th Anniversary this year. 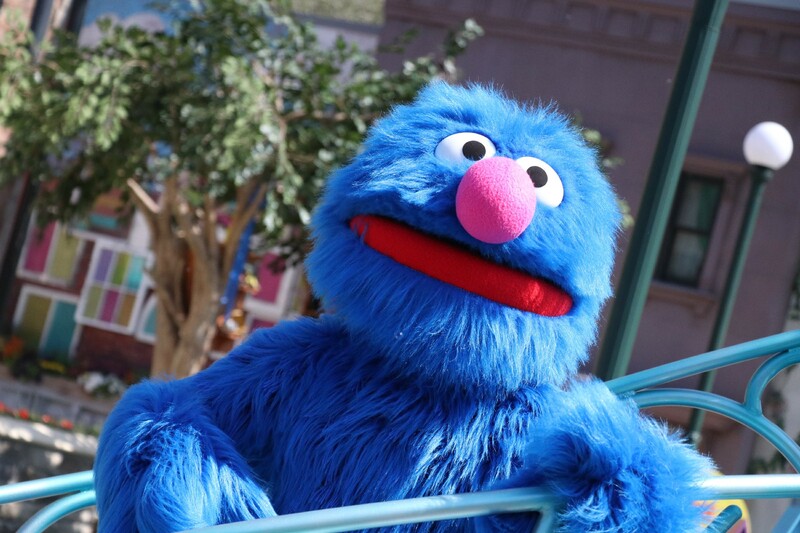 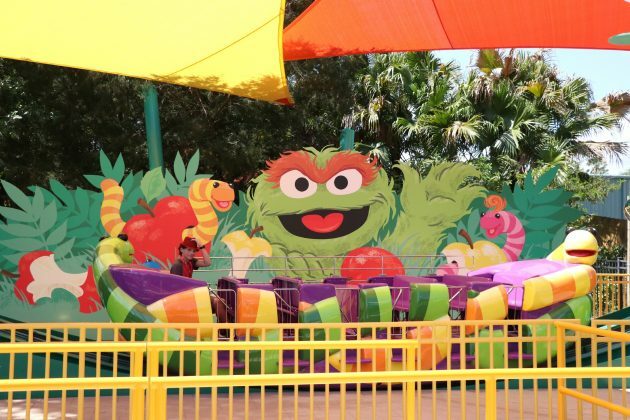 The six-acre area is the largest Sesame Street land inside of any of the SeaWorld parks. 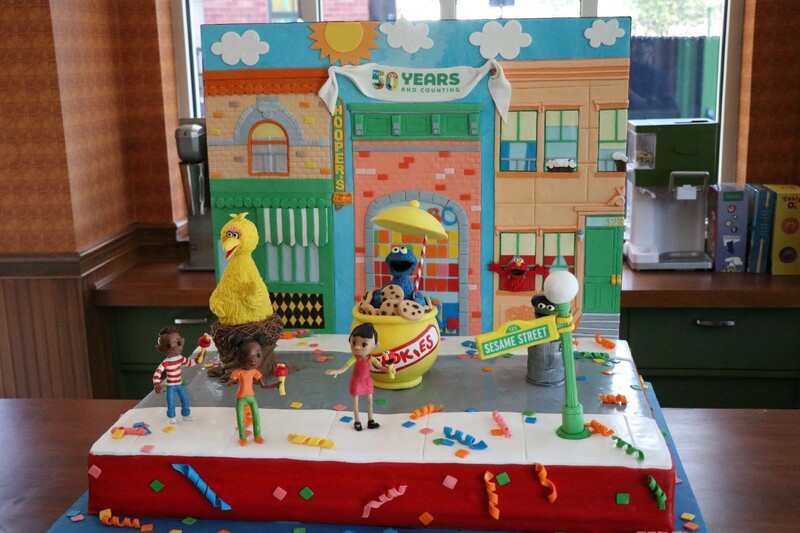 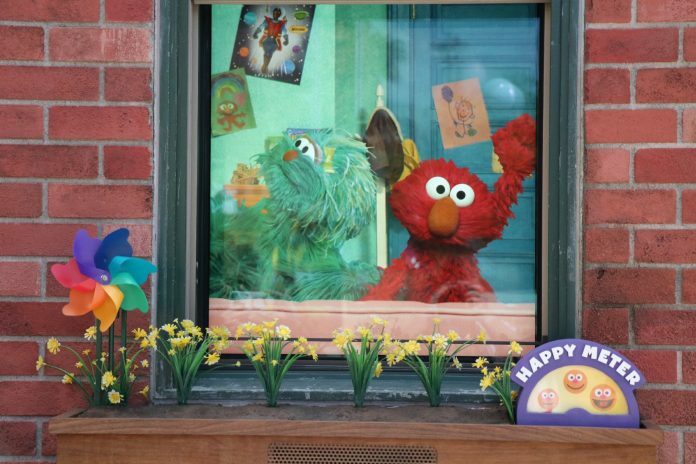 Sesame Street brings together fun and learning through several educational interactive experiences. The area itself replaces a lot of the rides that existed when it was known as Shamu’s Happy Harbor. 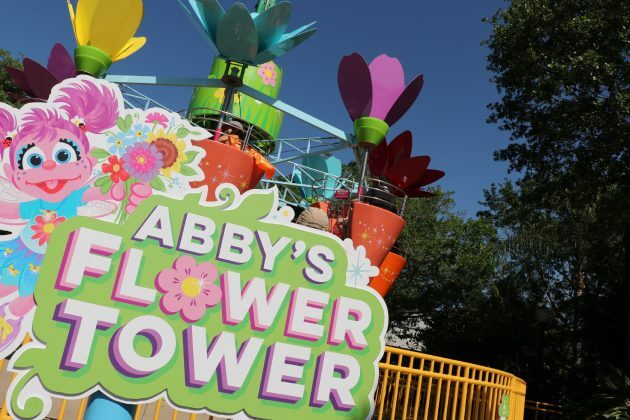 The Shamu Express is now Super Grover’s Box Car Derby, Jazzy Jellies is now Abby’s Flower Tower, and so on. 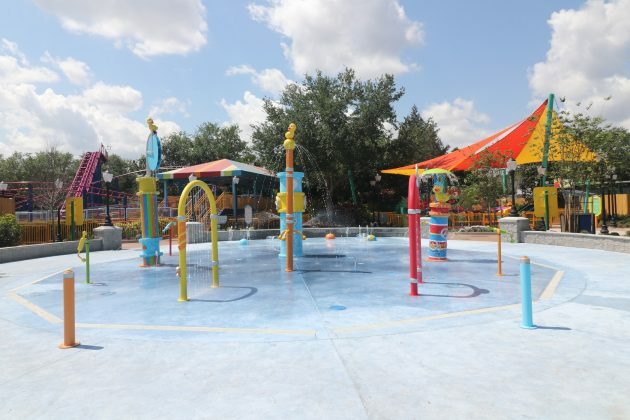 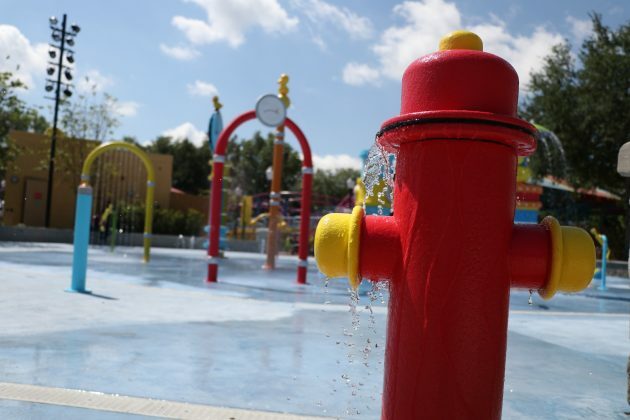 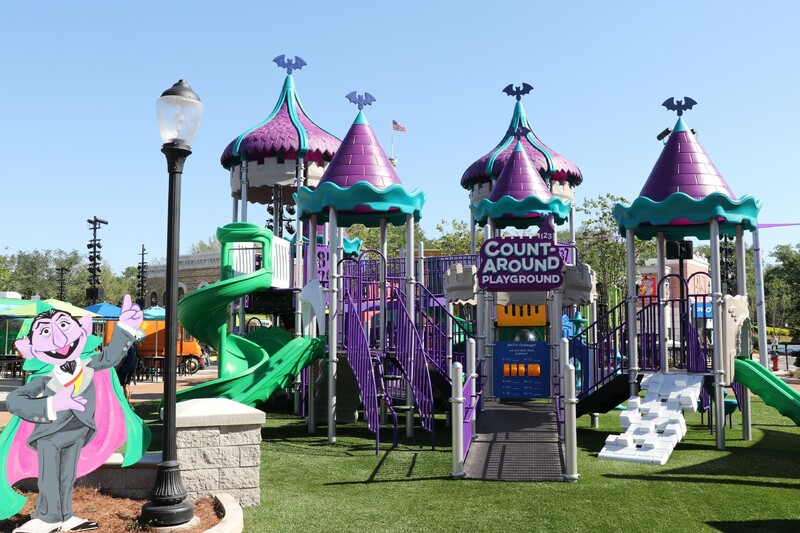 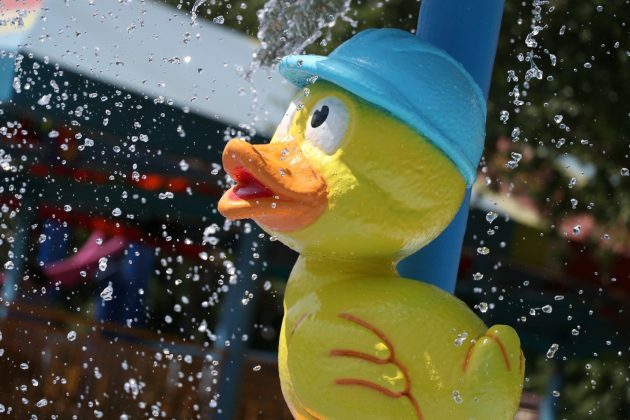 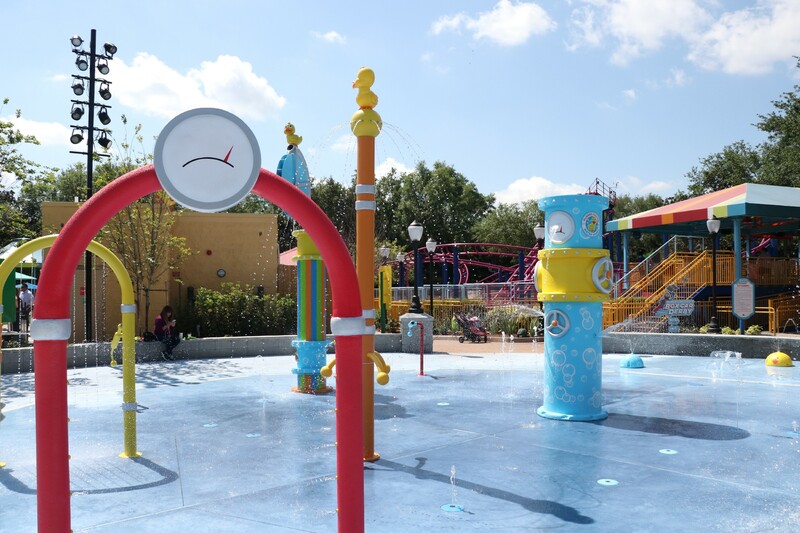 New additions include the Rubber Duckie Water Works water play area, The Count’s Count-Around Playground, and the actual Sesame Street area itself – which is where the bulk of your time is going to be spent. 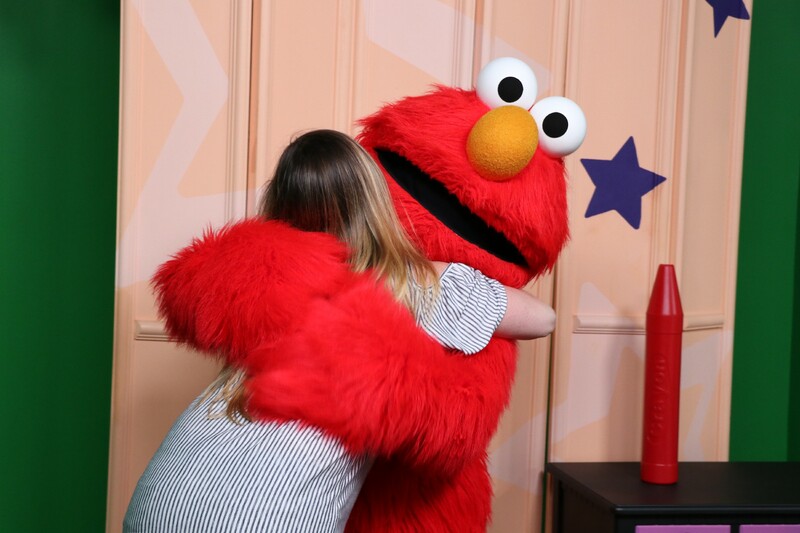 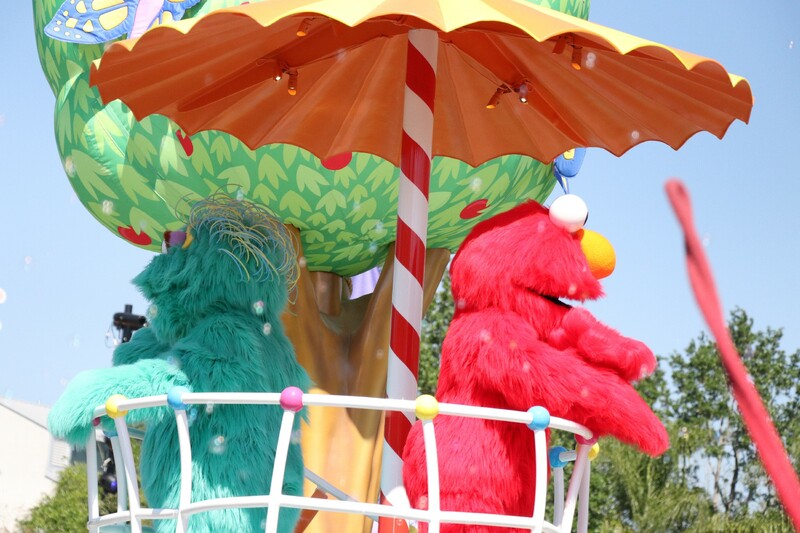 Throughout Sesame Street, guests can find plenty of interactive areas which come to life with the new “Elmo’s Interactive Light-Up Bubble Wand”. Unfortunately, the wand is not free – but definitely worth the investment for your children to unlock the full fun of the land. 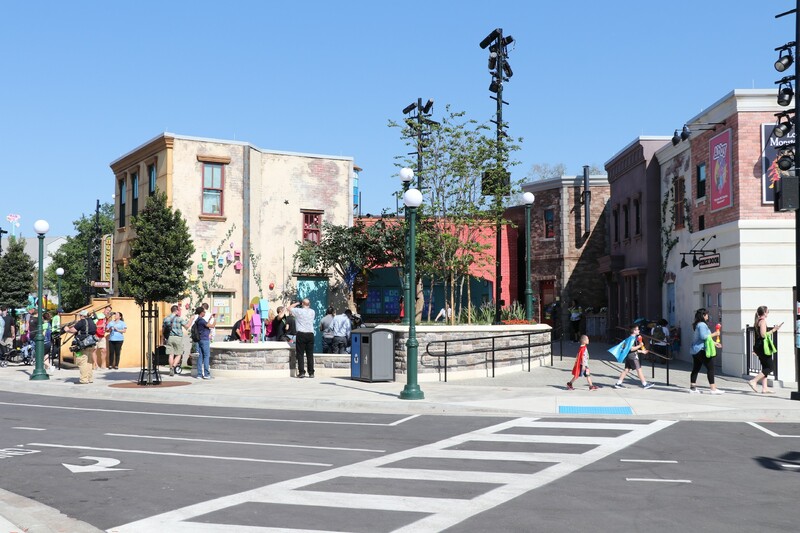 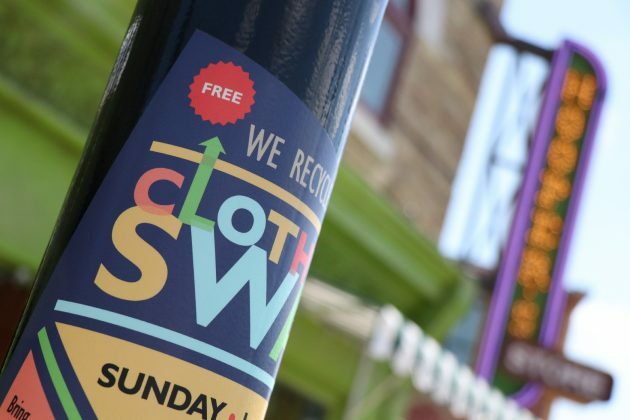 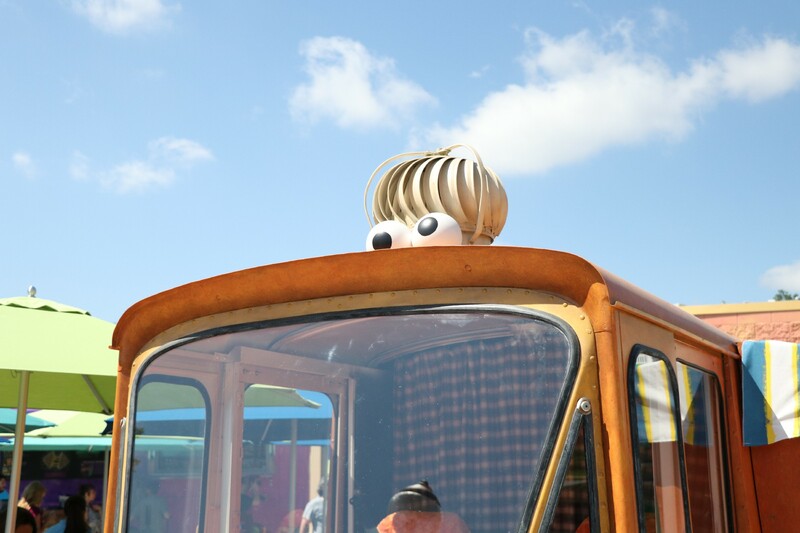 Kids can hold up their wand to specially marked areas throughout the land to trigger hidden surprises, special effects and exclusive content throughout the street. 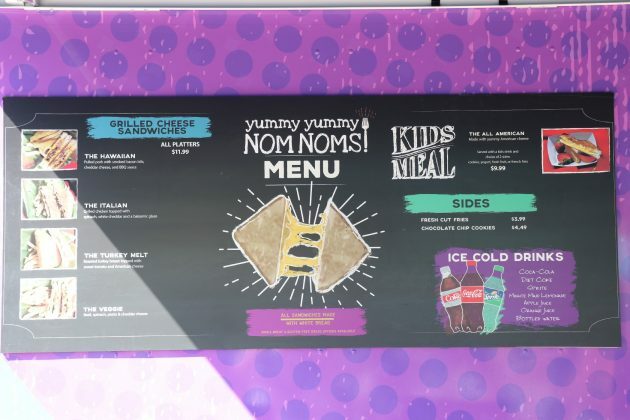 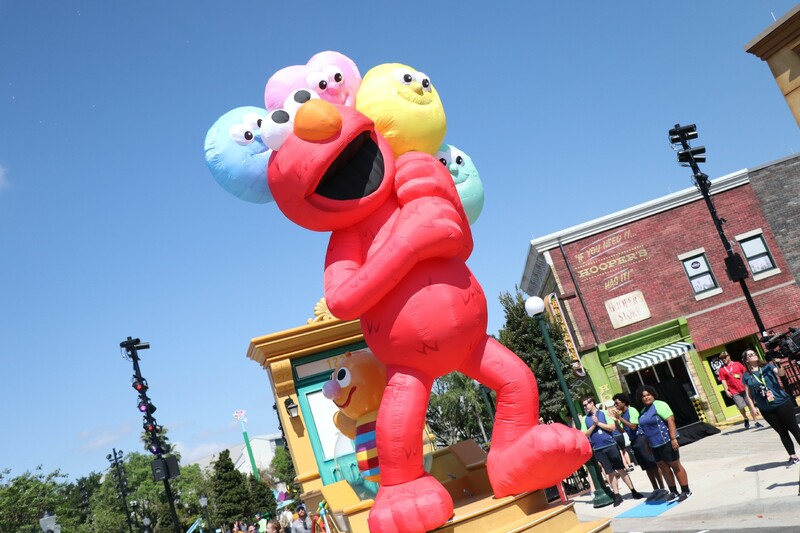 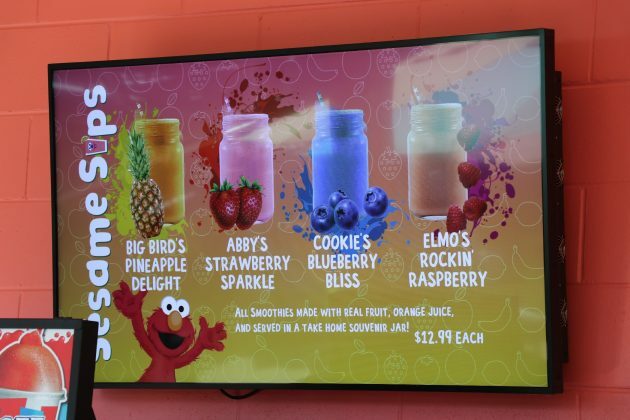 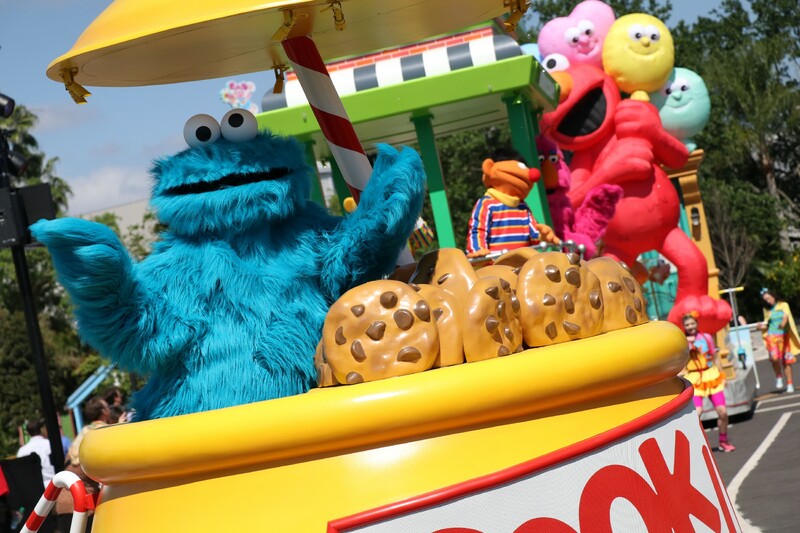 The good news is that there are other interactive areas that do not require the wand, such as Elmo’s Window and Cookie Monster’s Cookie Foodie Truck Challenge. 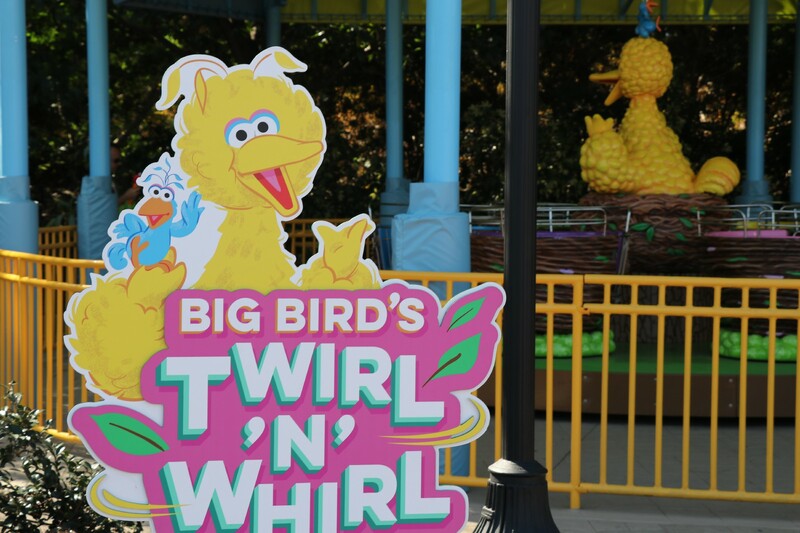 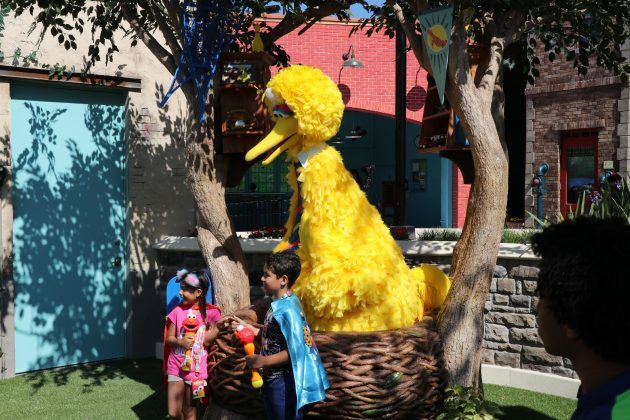 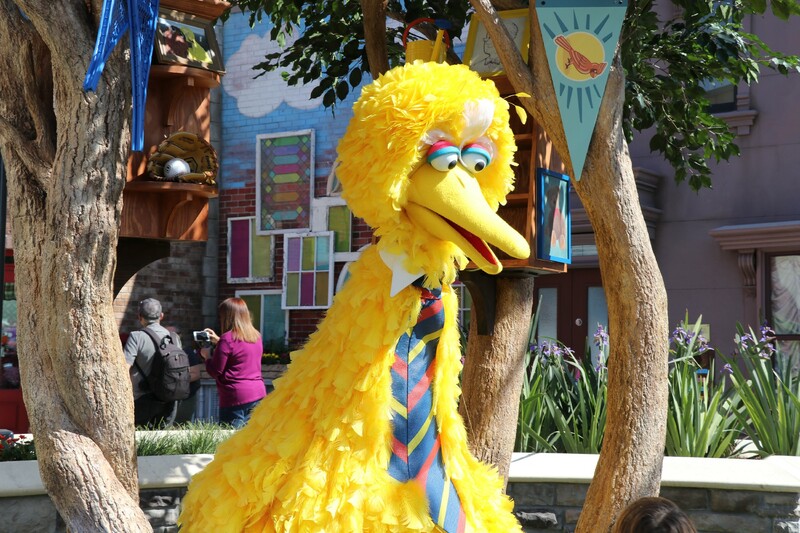 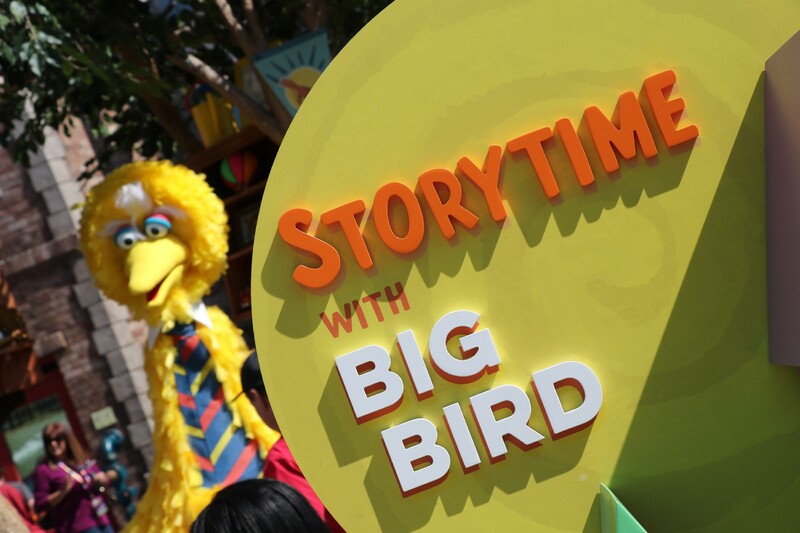 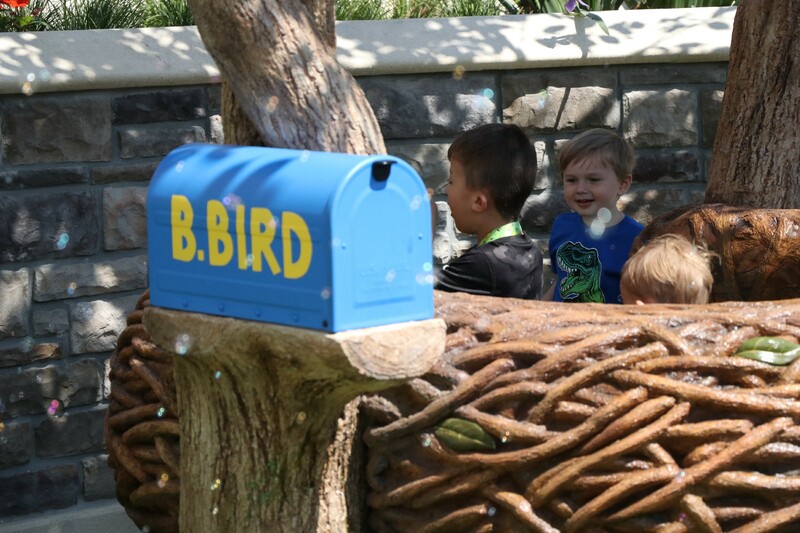 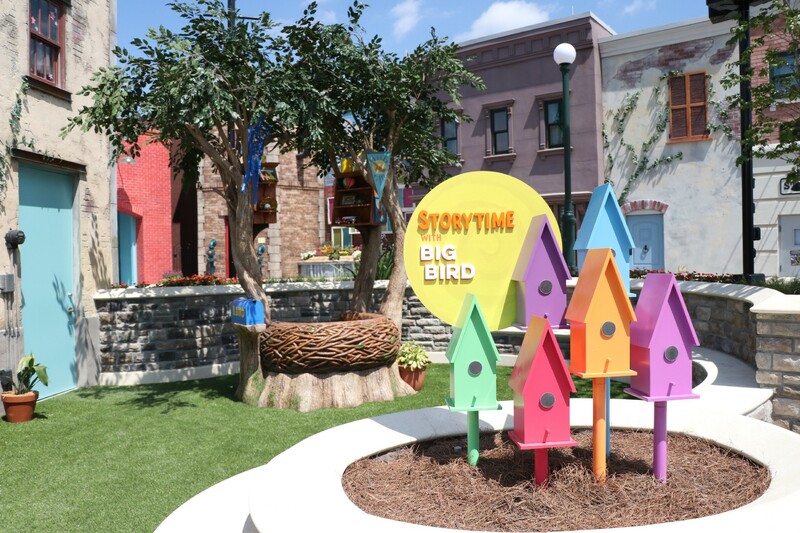 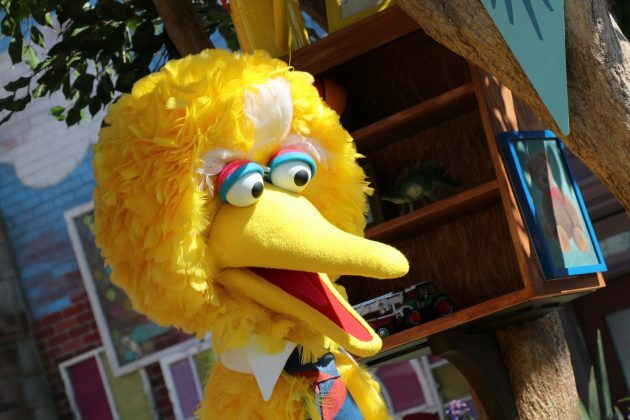 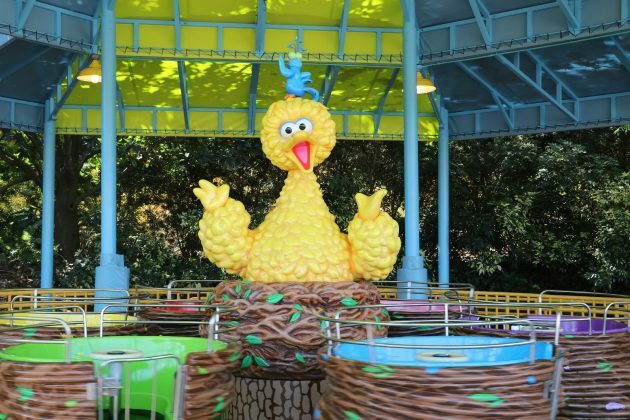 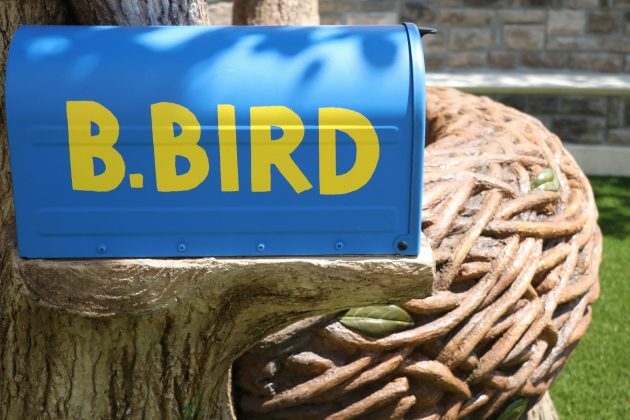 Guests can gather around Big Bird’s nest for “Storytime with Big Bird”, which is a wonderful interactive experience for kids to get up close with the beloved character. 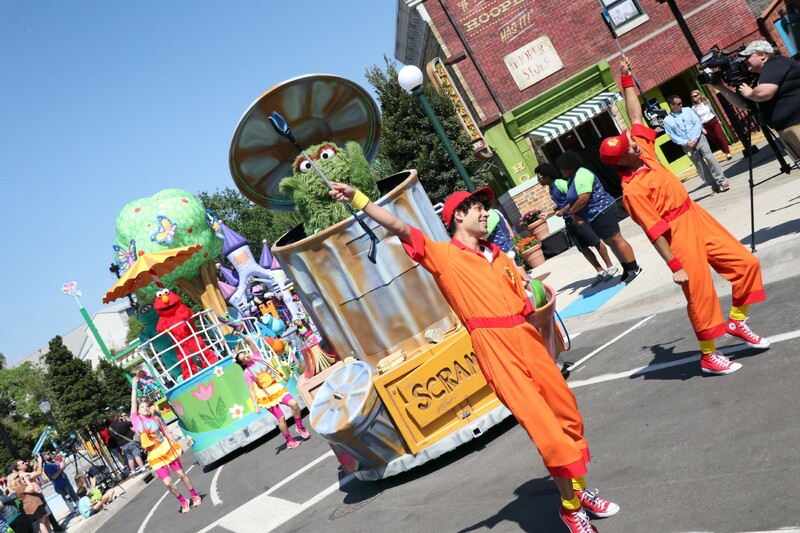 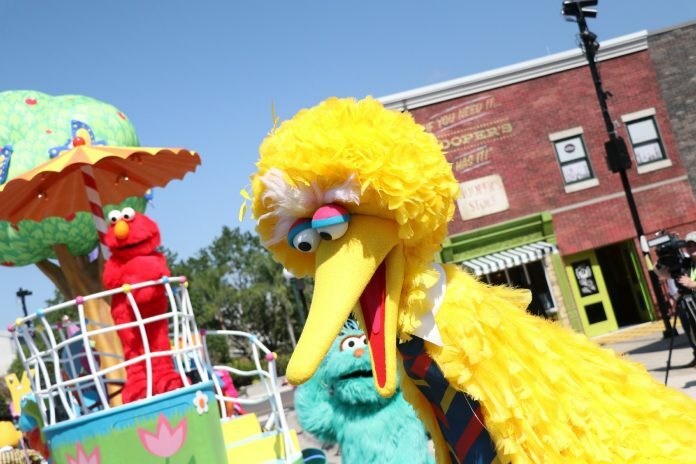 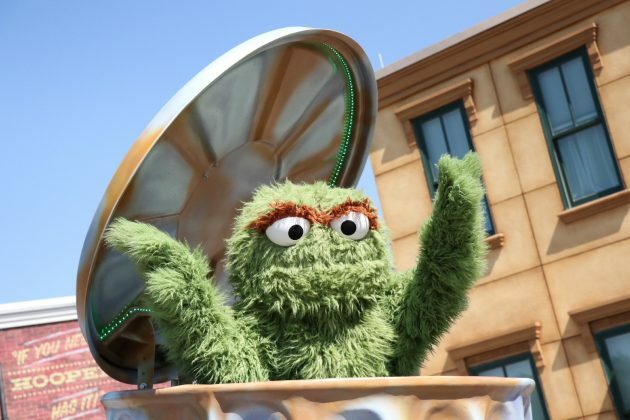 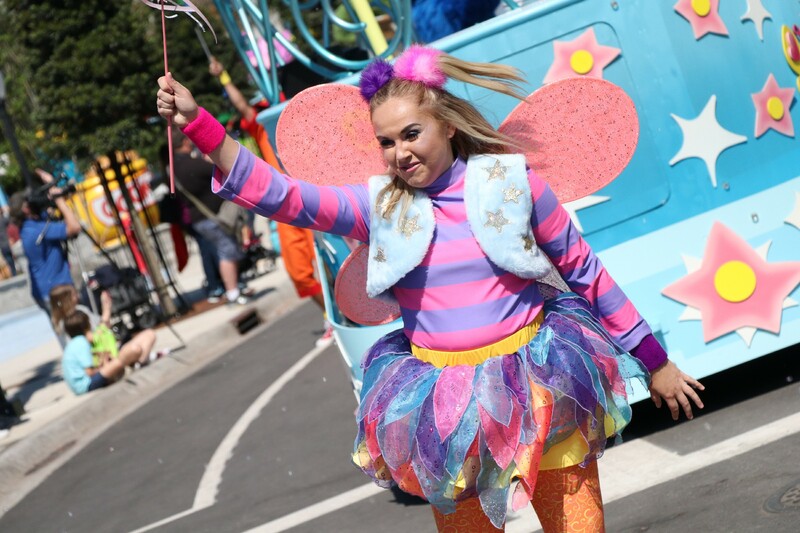 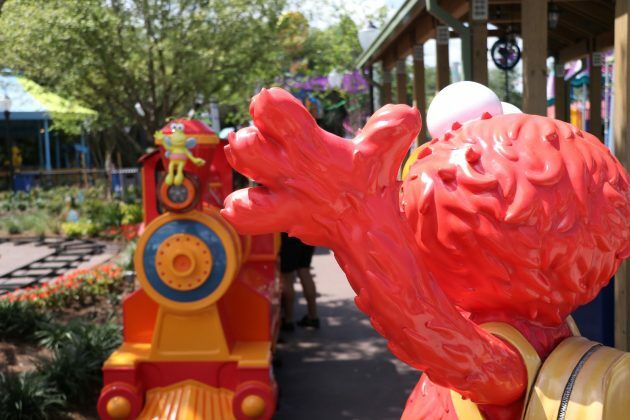 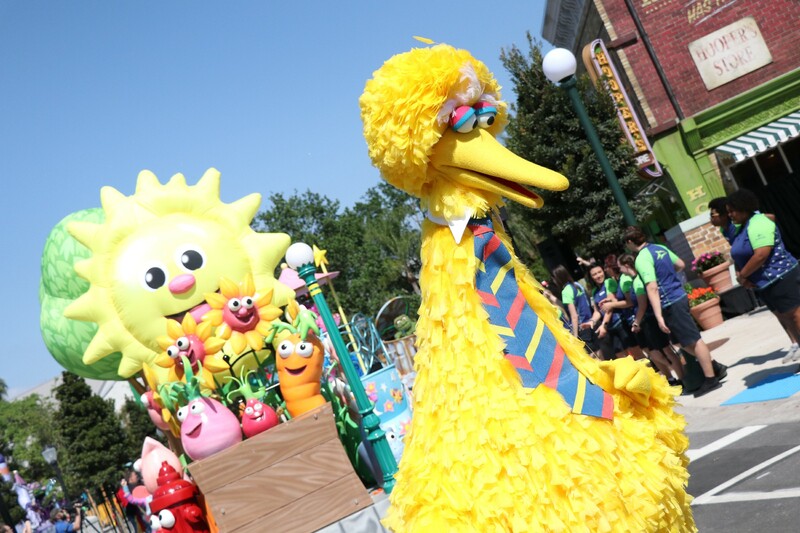 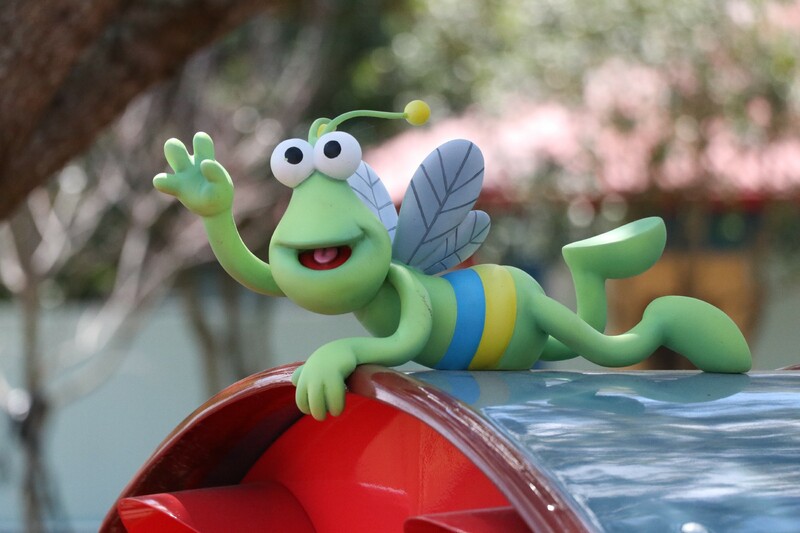 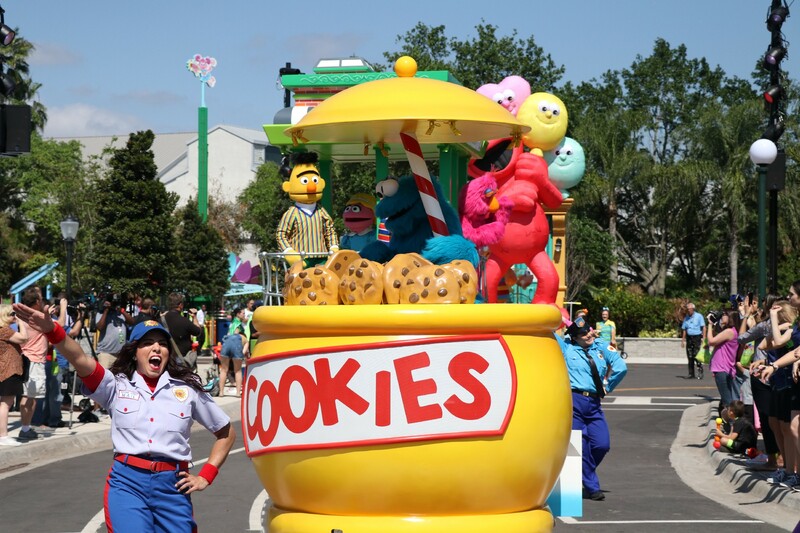 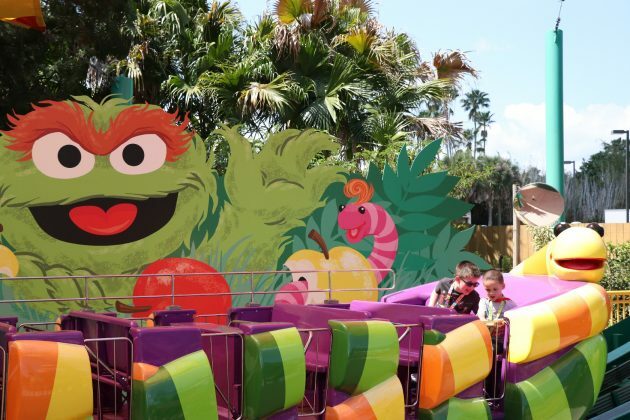 The standout of the addition is the Sesame Street Party Parade, which is SeaWorld Orlando’s first-ever parade. 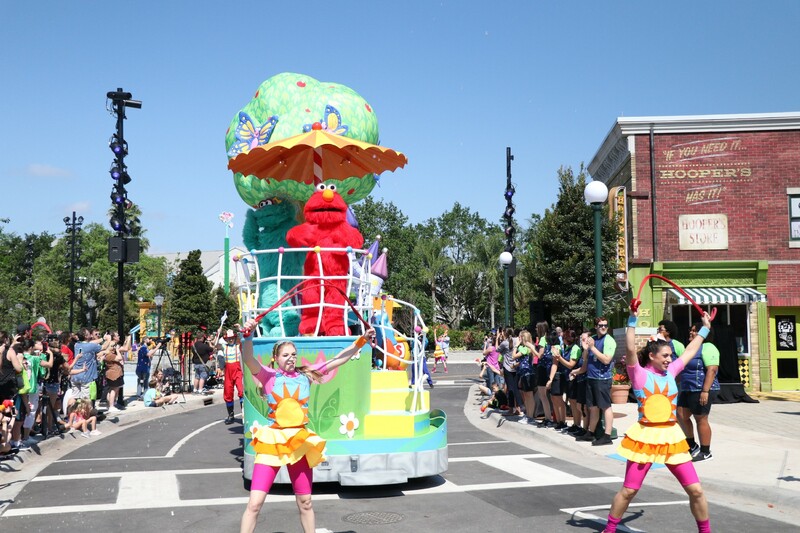 All the characters guests love from the show come marching and dancing down the street, accompanied by decorative floats, dancers, and encourage kids to join in on the fun. 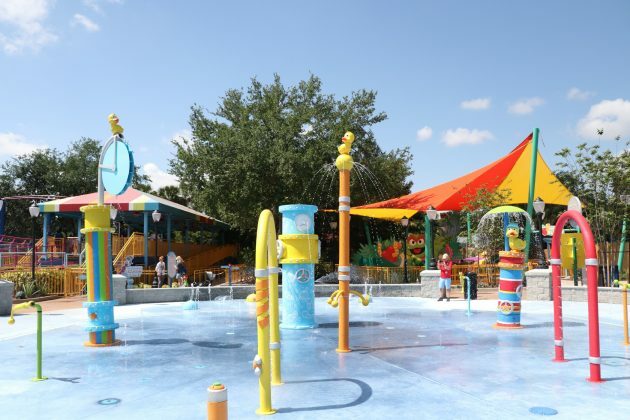 There are few stumbles, however minor, with the most glaring one being a lack of shade; which could present some issues in the Summer months with that brutal Florida sun. 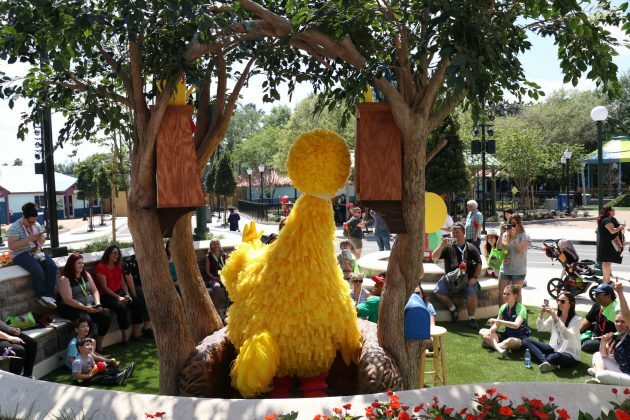 Seating also seemed to be an issue when it came to eating lunch. 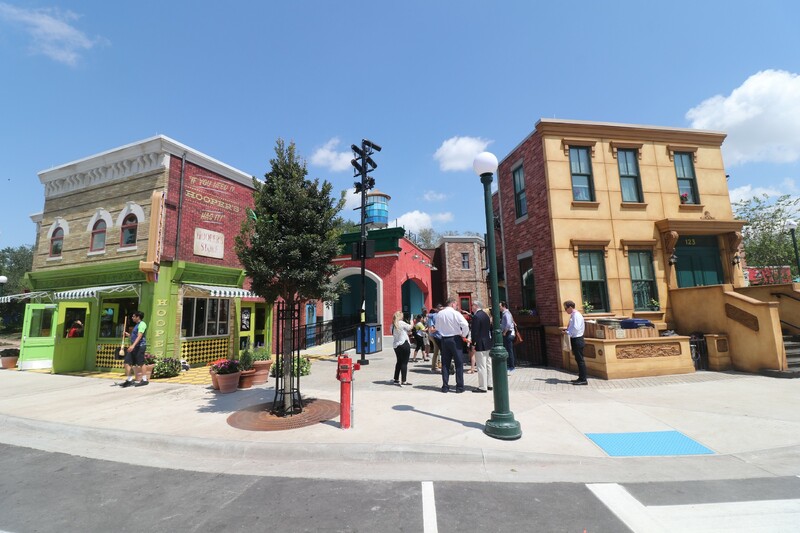 Our visit was during a media preview, so capacity was very low and we had trouble finding a table. 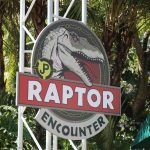 That WILL NOT be the case as the land officially opens. 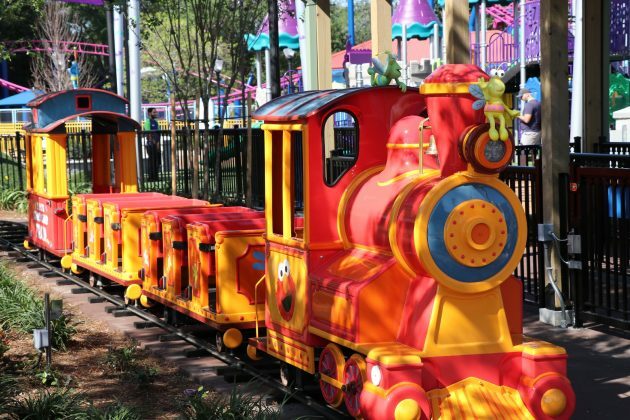 While the land is great, the area may skew a bit more on the under-6 kid crowd. That’s not to say that kids of all ages can’t have fun – but is something that could impact certain kids, but definitely something that can be addressed. 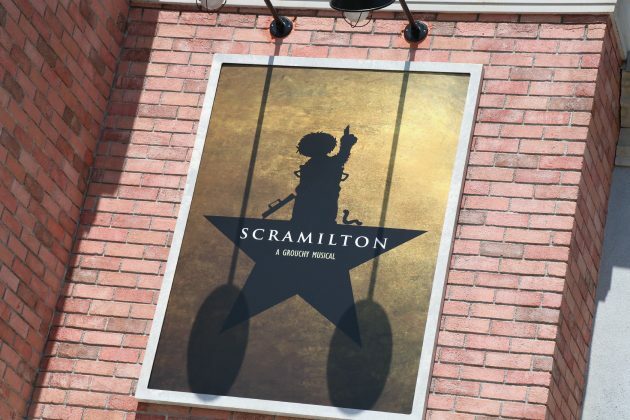 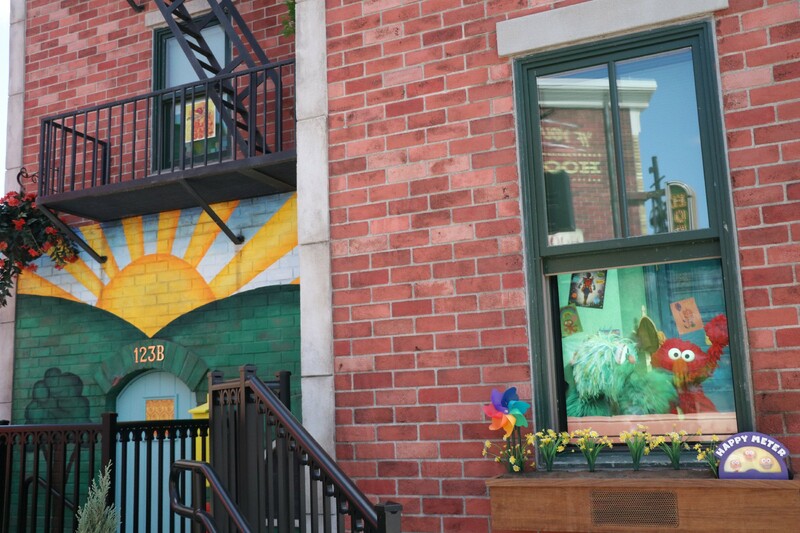 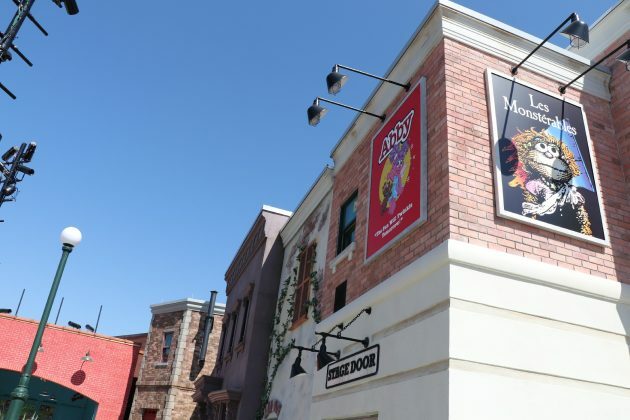 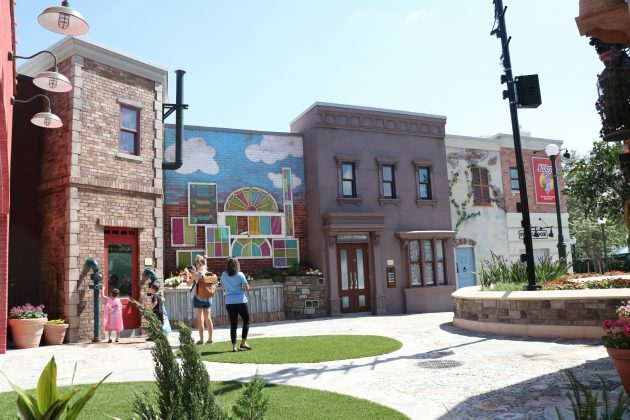 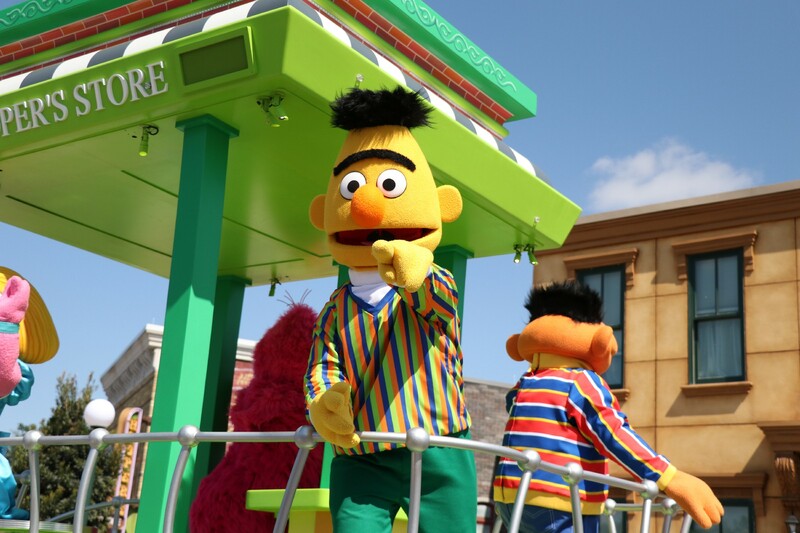 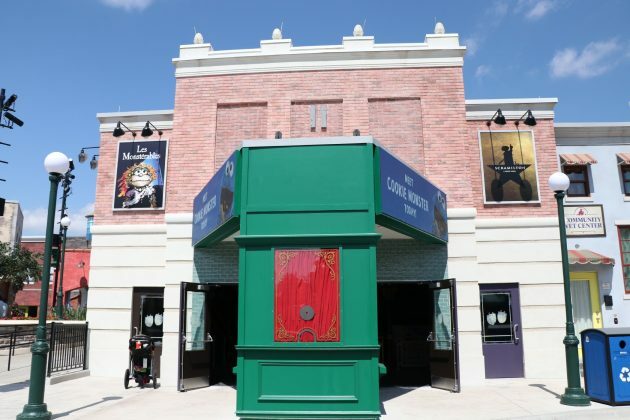 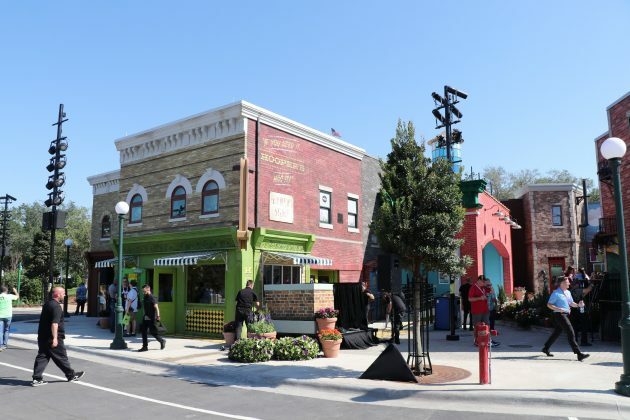 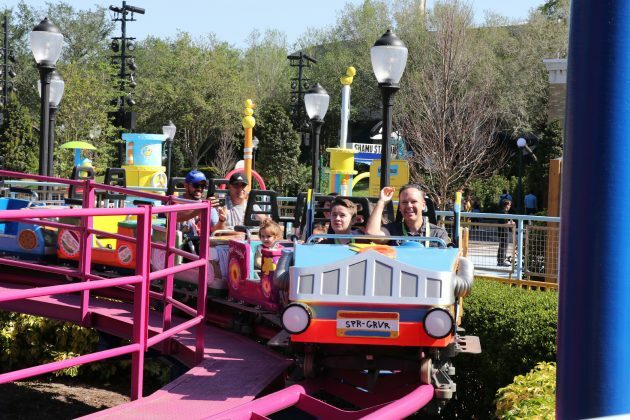 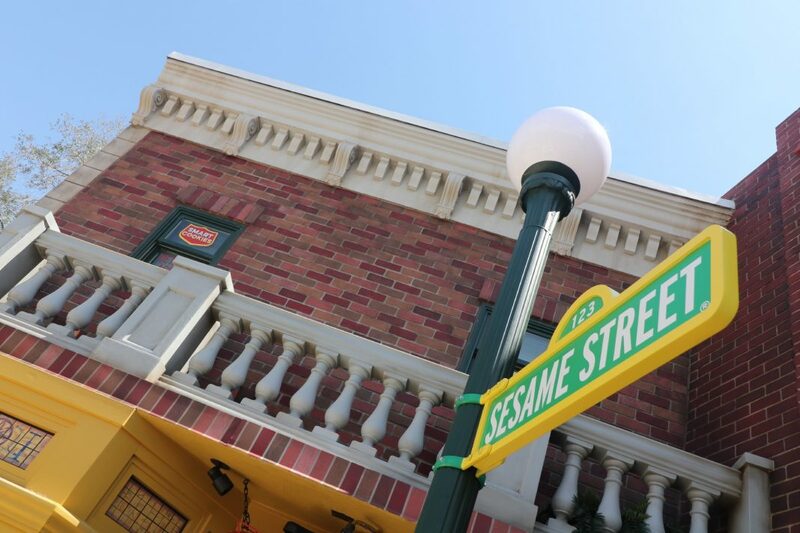 As the land does cater to children, parents will be glad to know that there are several areas that should help them during their visit to Sesame Street. 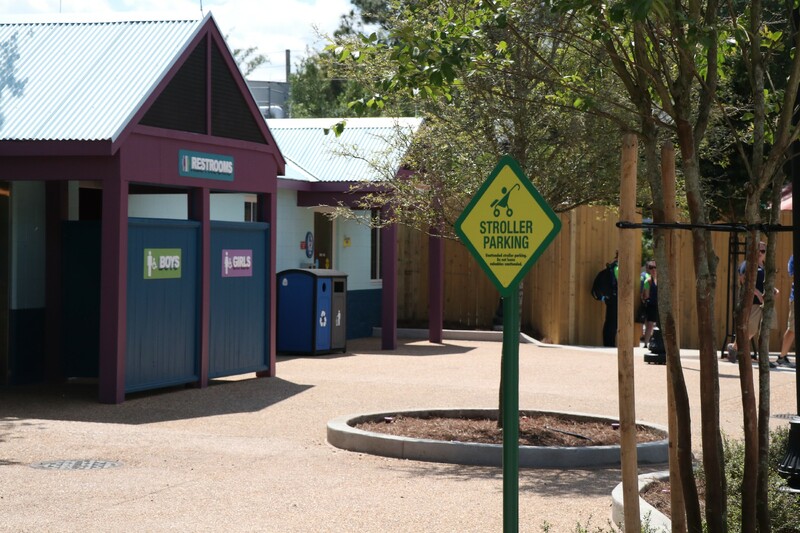 Parents with babies will be glad to know there is a huge Baby Care building towards the back of the land. 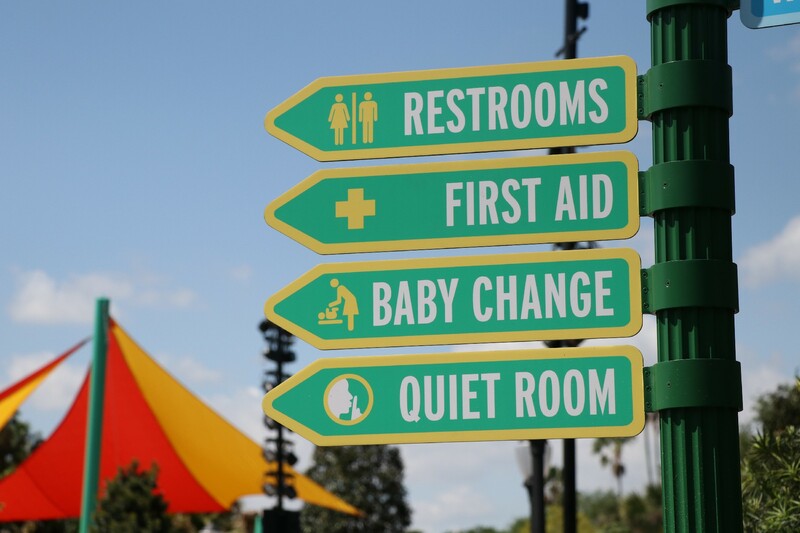 In addition, for parents with children on the autism spectrum, there is a Quiet Room available for their comfort. 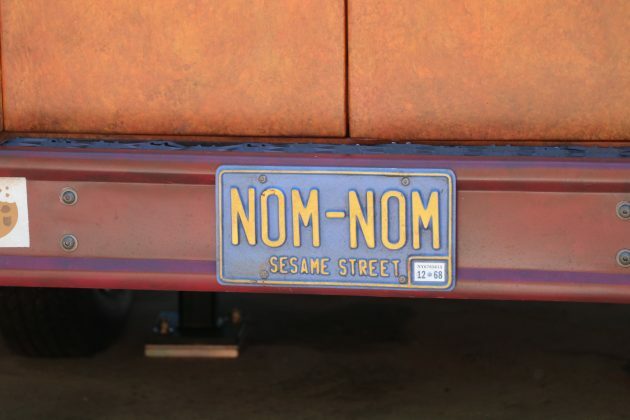 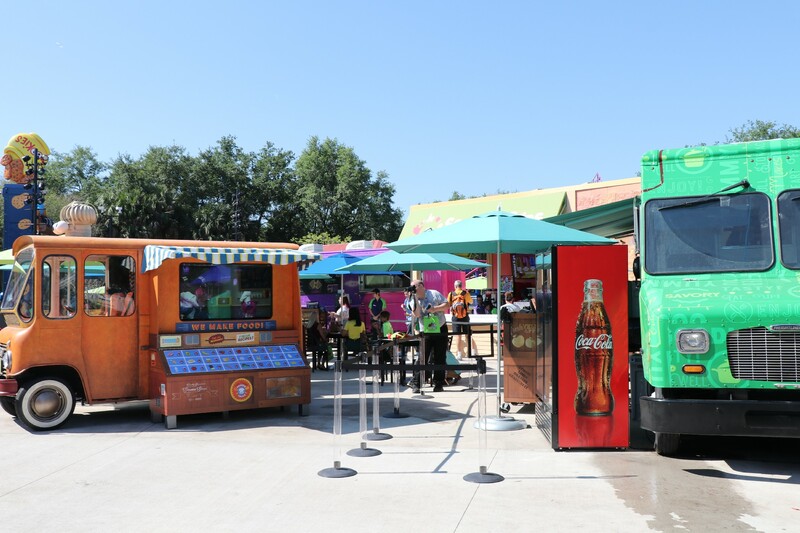 Eats on the Street, Sesame Street’s food area, is serviceable. 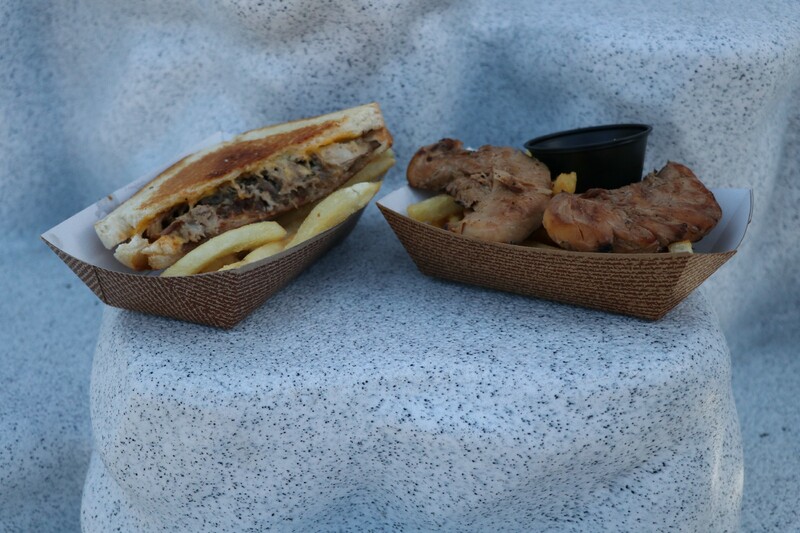 During our visit, we ordered Hawaiian Grilled Chicken Tenders, which served with Island BBQ sauce with a side of french fries; and the Hawaiian Grilled Cheese Sandwich, which is a pulled pork sandwich with smoked bacon bits, cheddar cheese, and BBQ sauce with a side of fries. 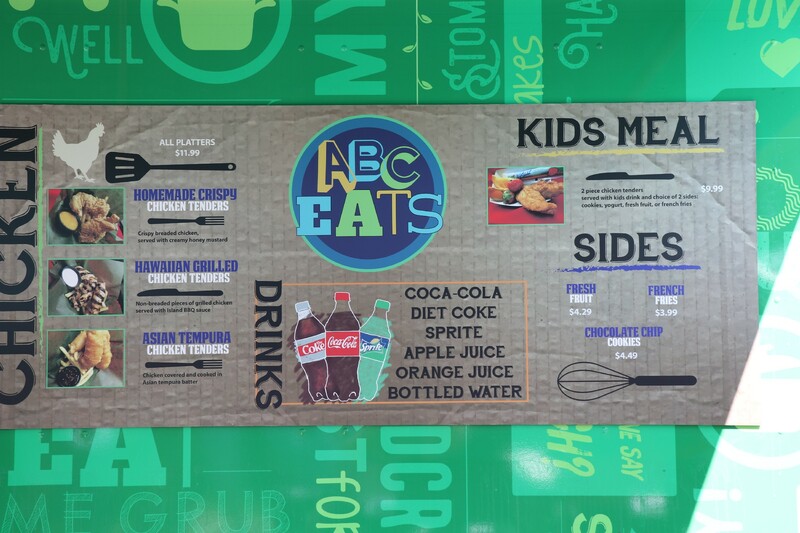 While the sandwich was delicious and definitely something we would recommend ordering, the grilled chicken was a little underwhelming. We can’t complain too much though, as the menu is meant to appeal to children. 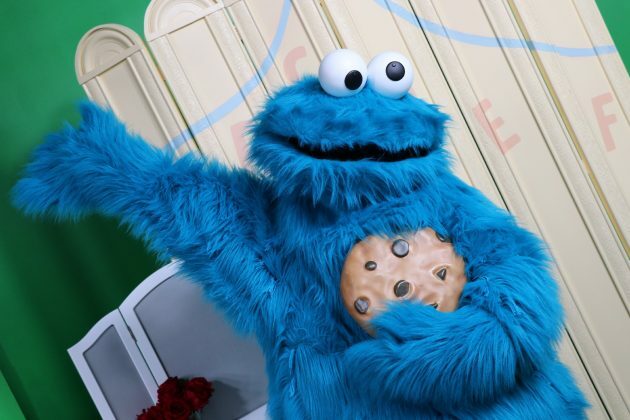 Sesame Street’s themed snacks include the obvious Cookie Monster’s Chocolate Chippy, which are giant blue cookies with white chocolate chips, and fruit smoothies, which are different flavored smoothies that tie to different Sesame characters and are made with real fruit. 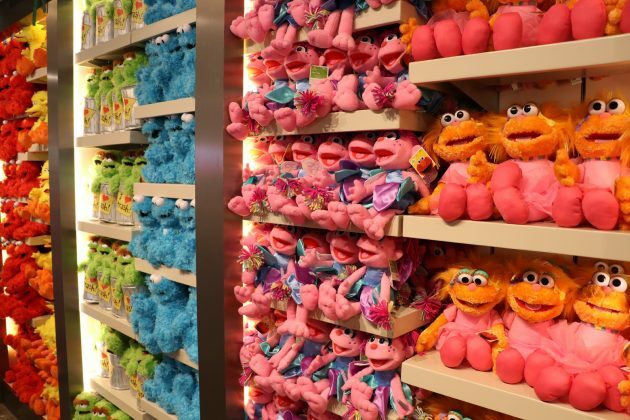 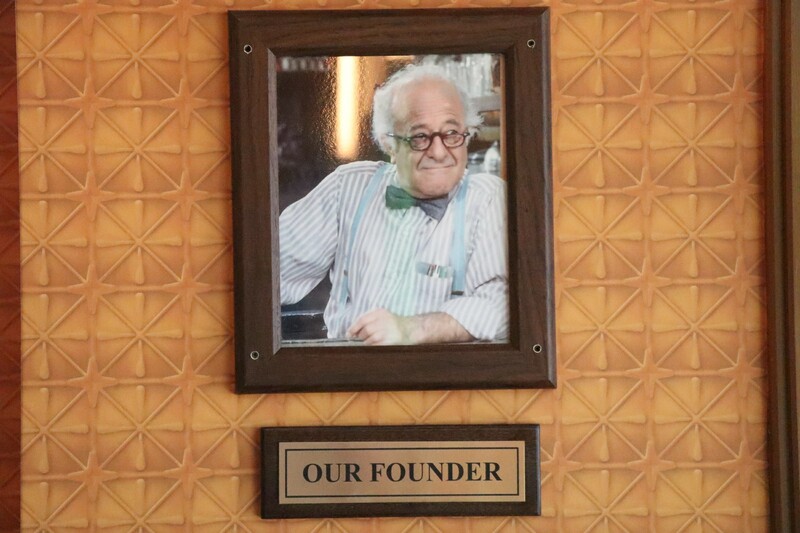 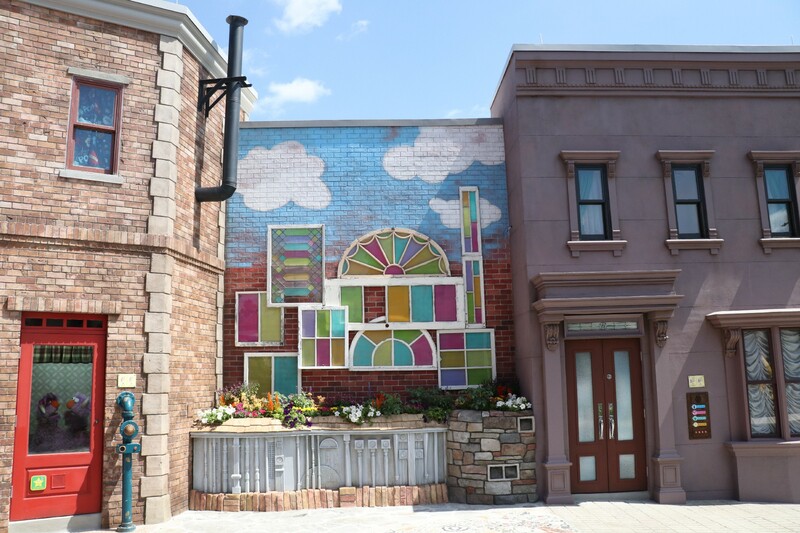 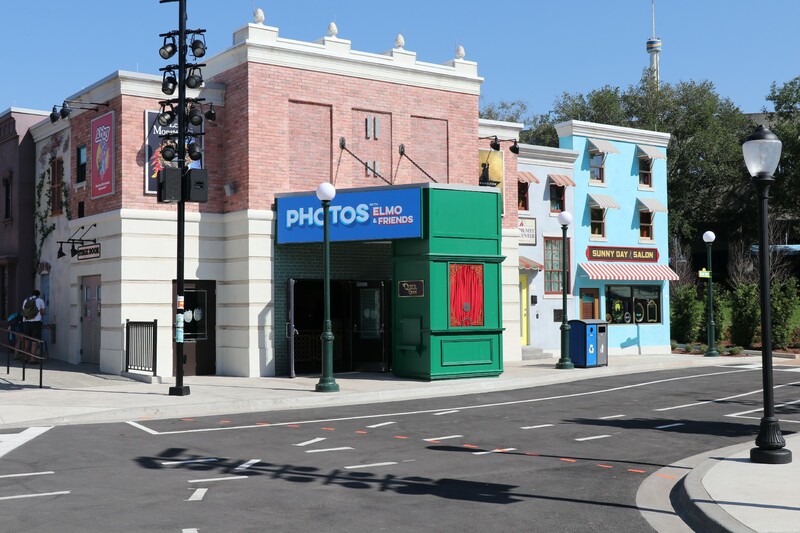 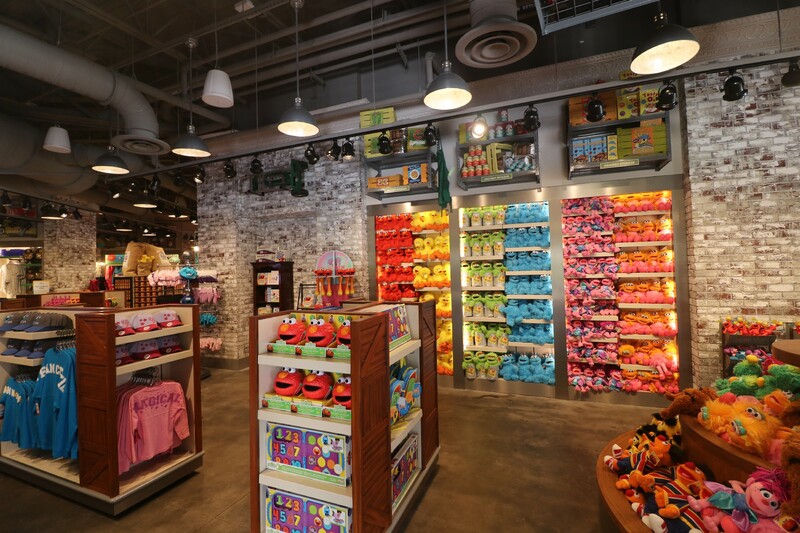 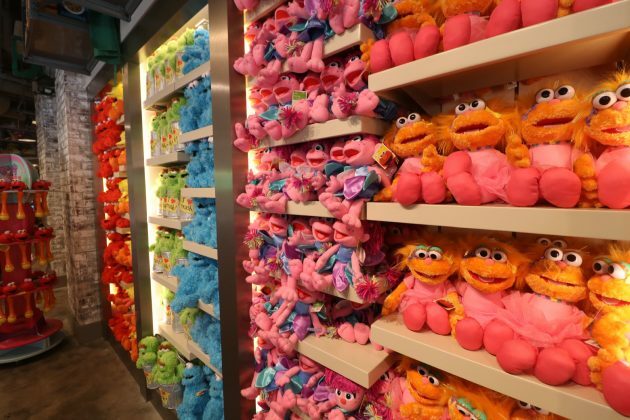 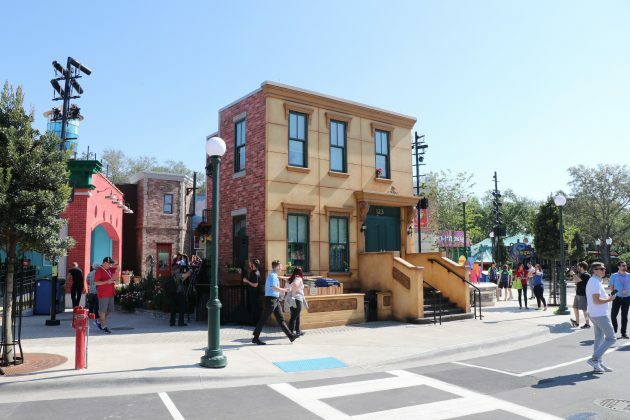 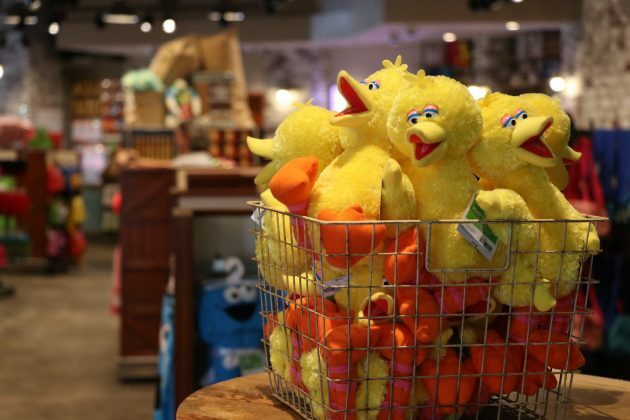 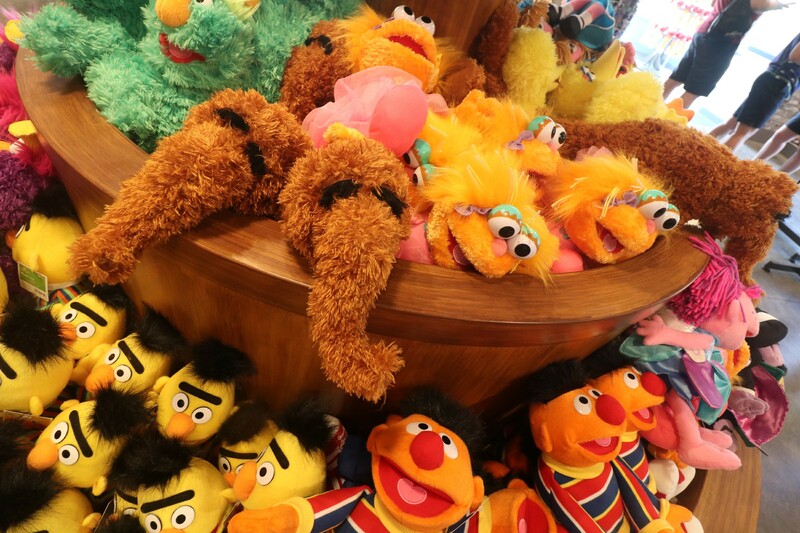 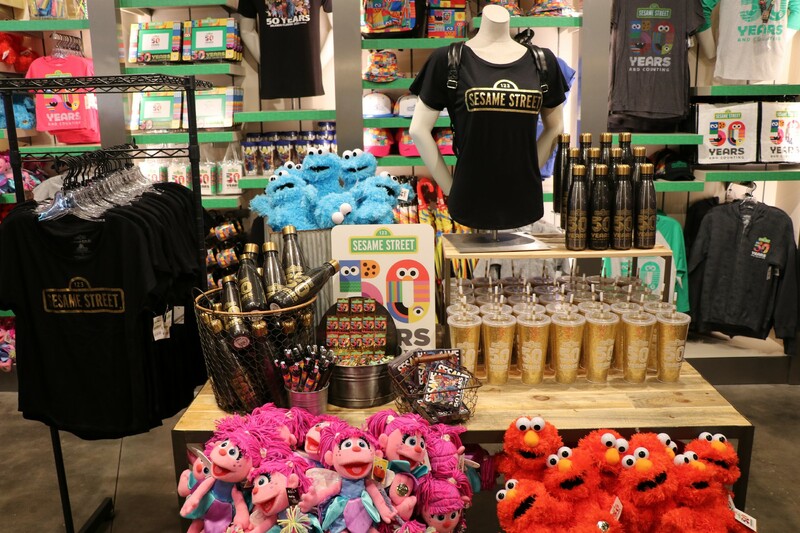 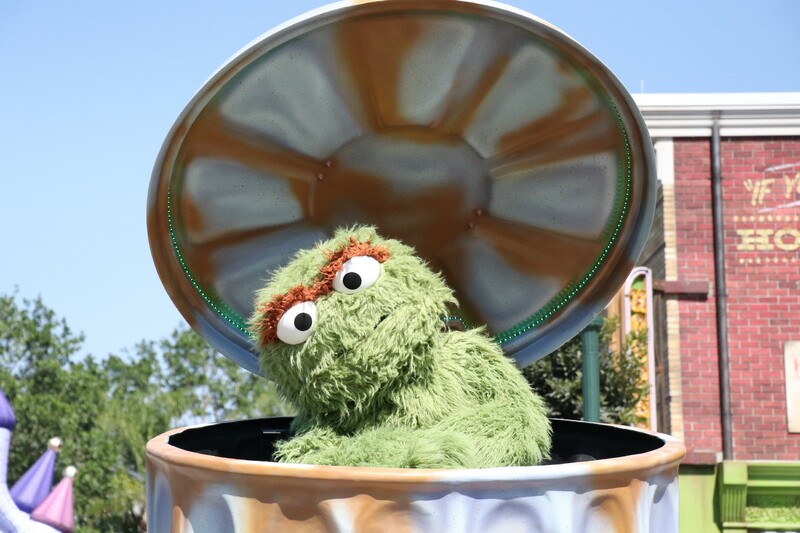 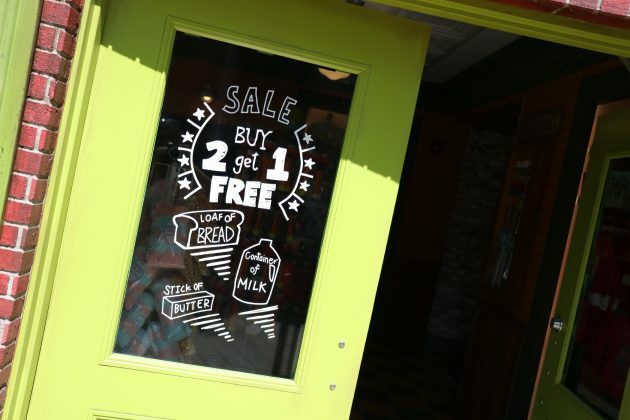 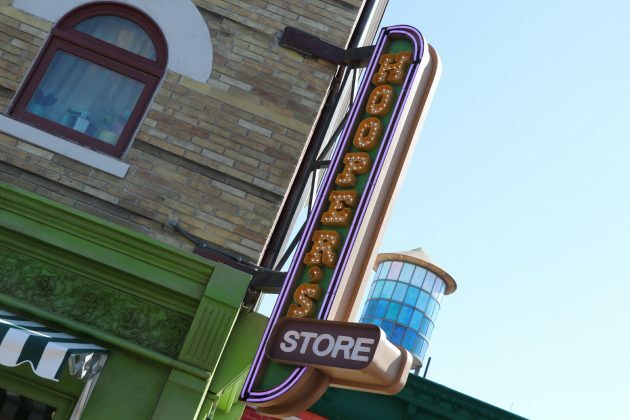 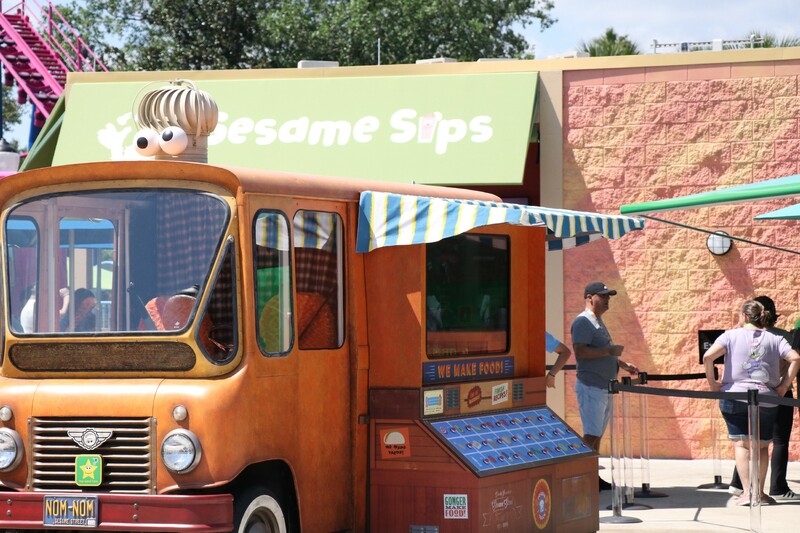 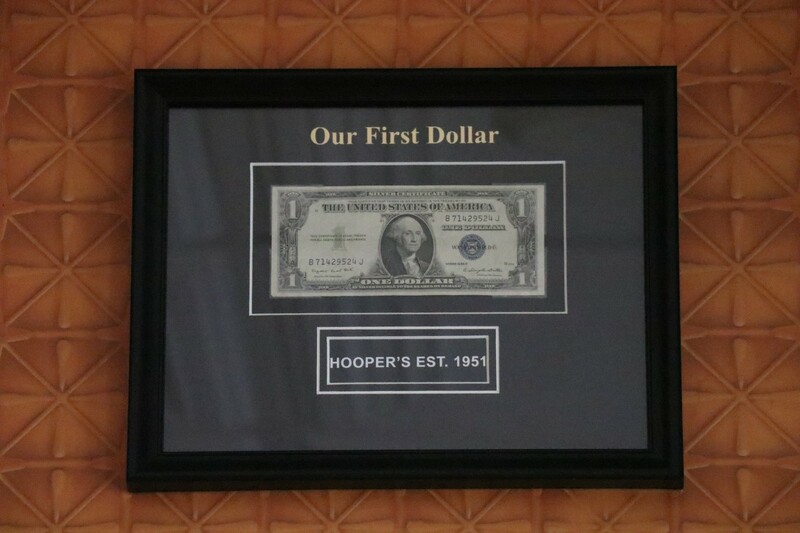 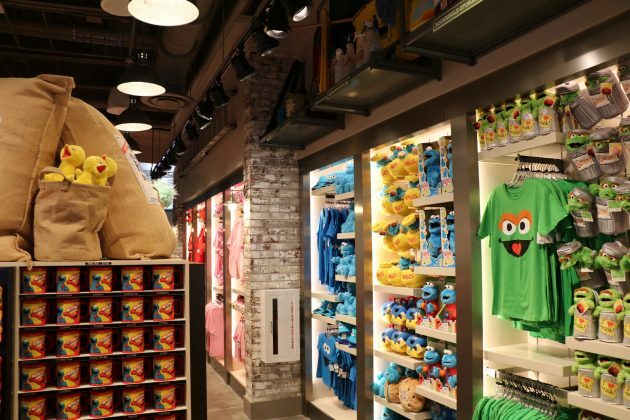 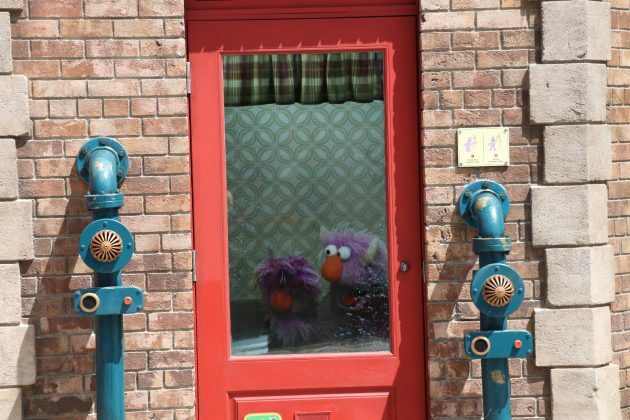 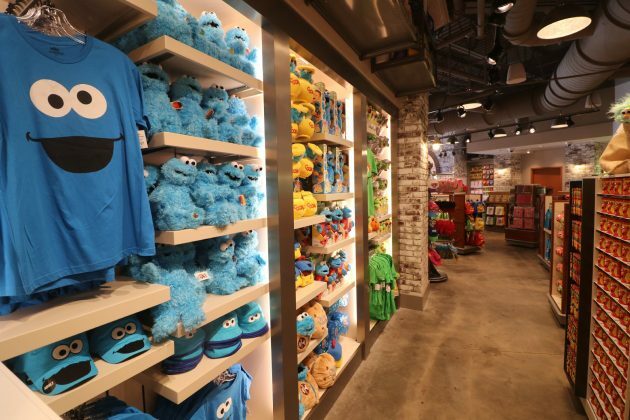 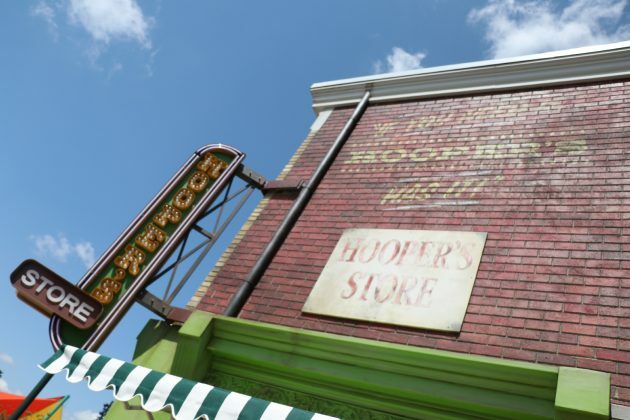 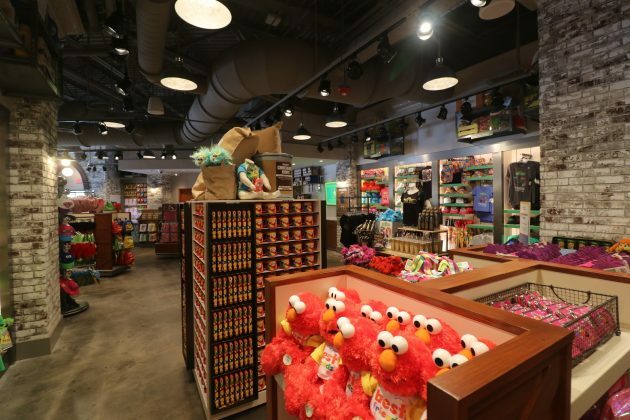 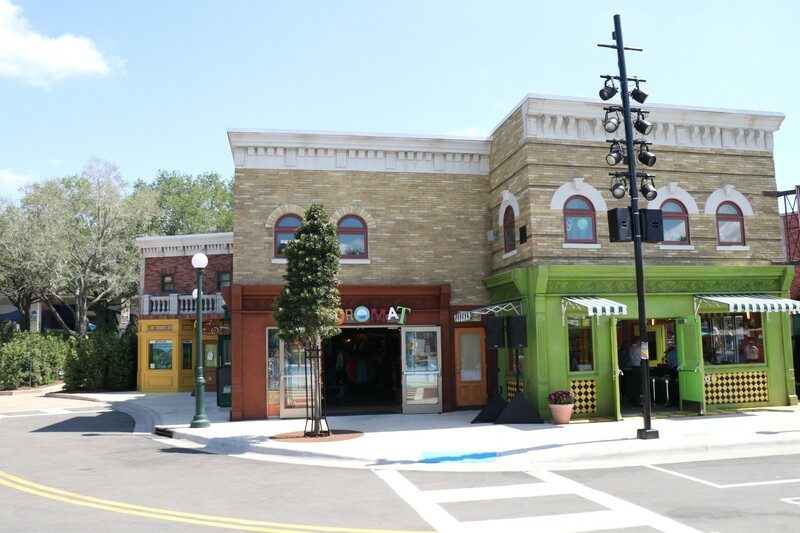 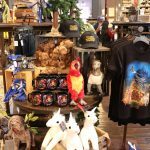 Elsewhere around the land, guests can go inside Mr. Hooper’s Store, where they can find anything and everything Sesame Street, with plush characters, apparel, collectible pins, cups, mugs, and more. 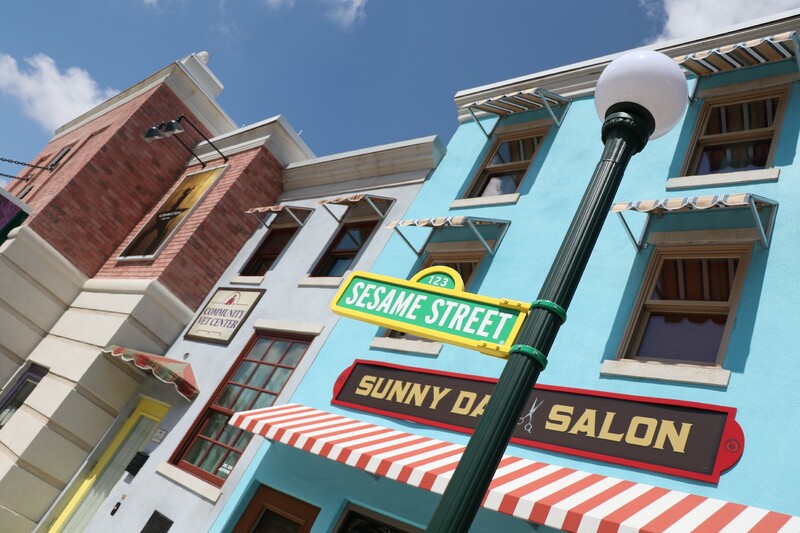 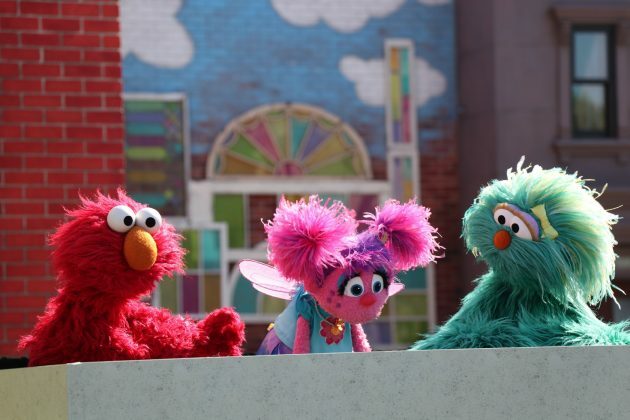 Of course, it wouldn’t really be Sesame Street without being able to meet the characters from the show – which you can find throughout the land. 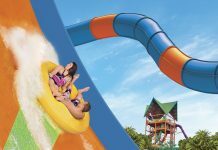 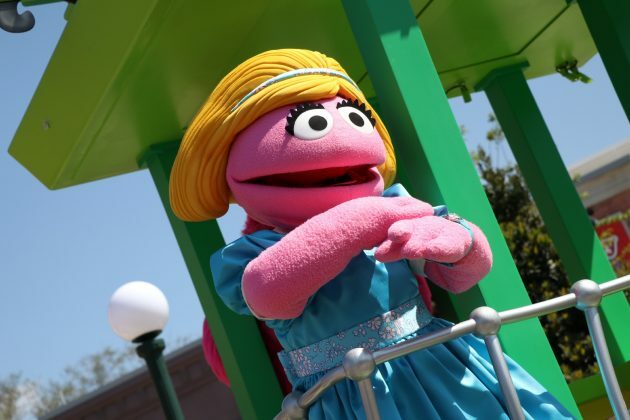 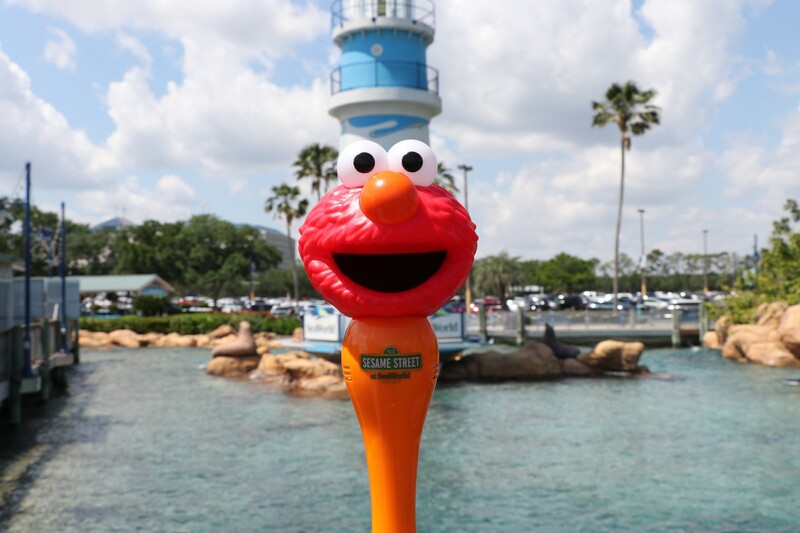 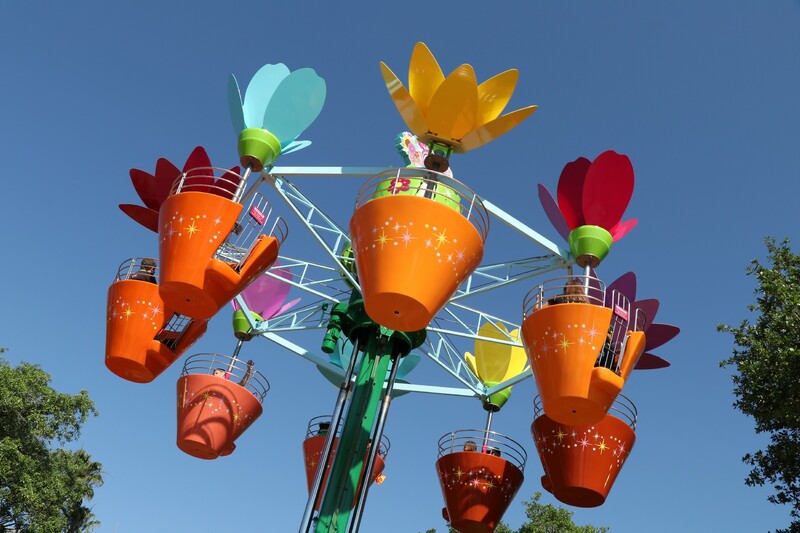 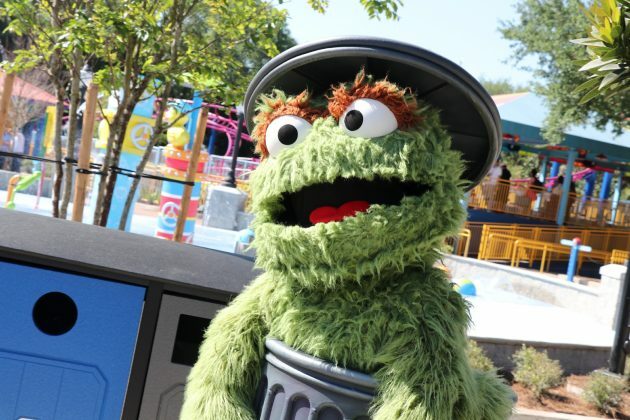 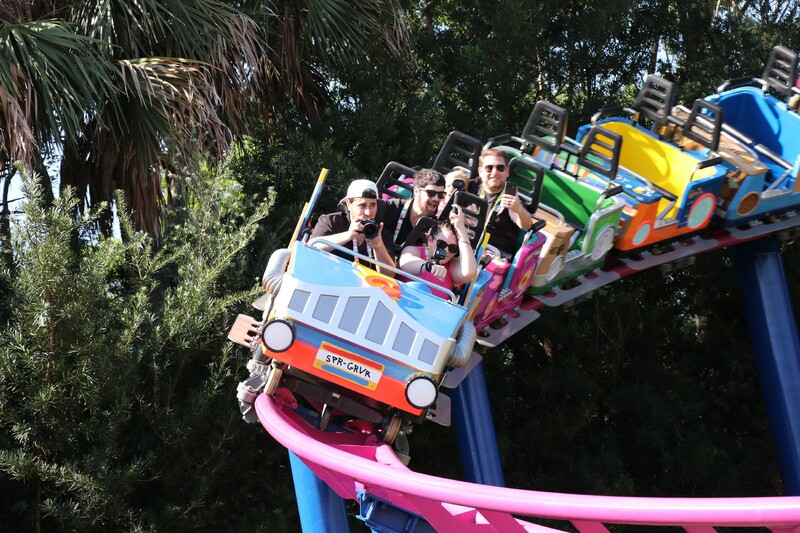 SeaWorld really knows how to appeal to kids and families – from interacting with the animals to the various seasonal events, Sesame Street is another reason to visit SeaWorld, especially if you have young children. 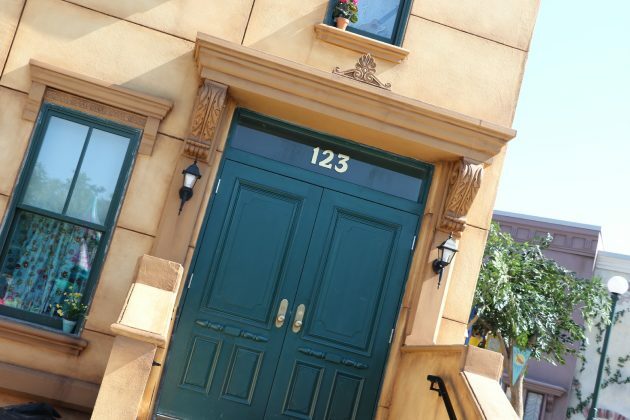 They have done a fantastic job of bringing the television show to life. Walking past that iconic green and yellow street sign brought a smile to our faces and reminded us older folk of our childhood. 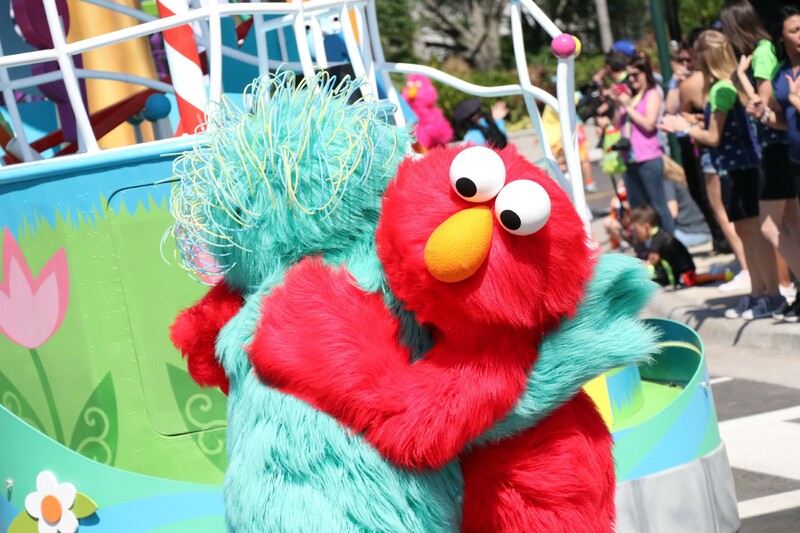 Parents will undoubtedly feel the same, along with sharing that joy with their children. 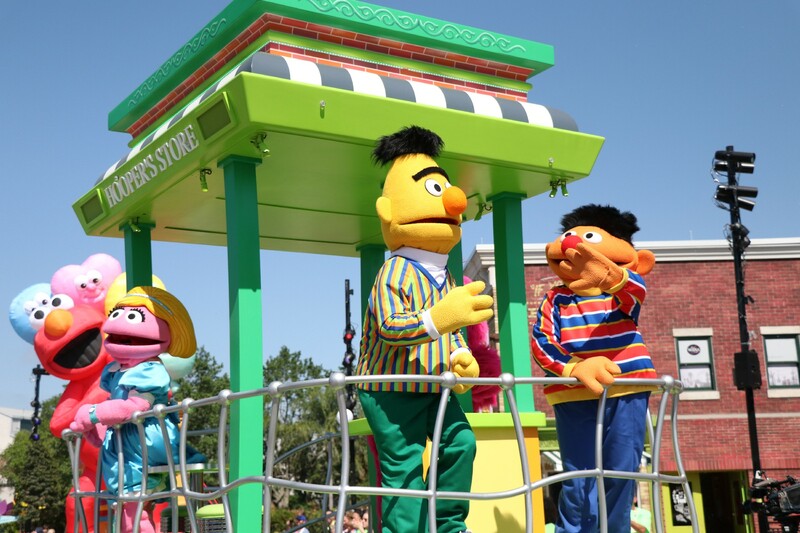 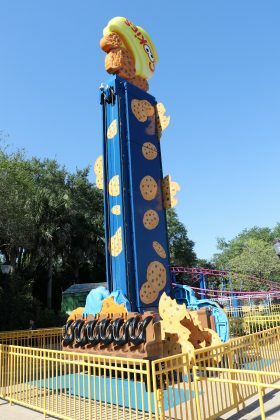 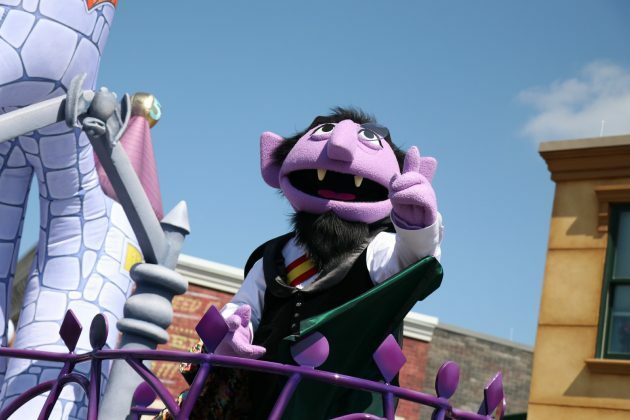 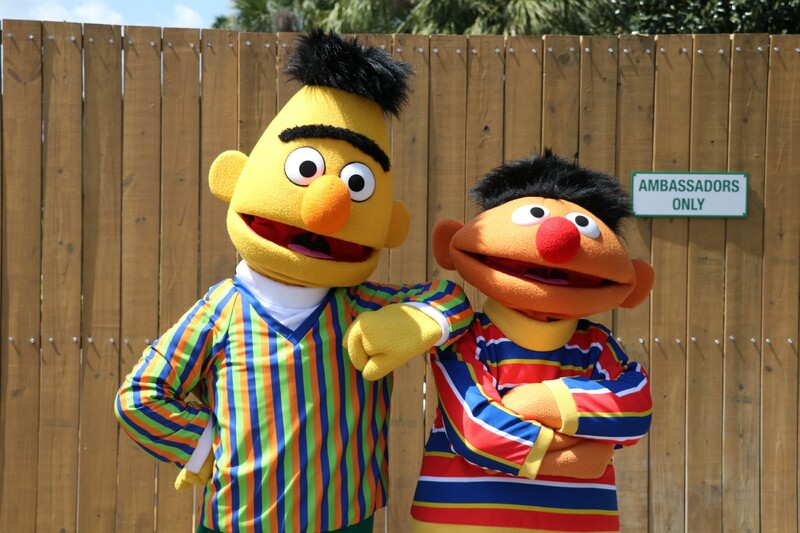 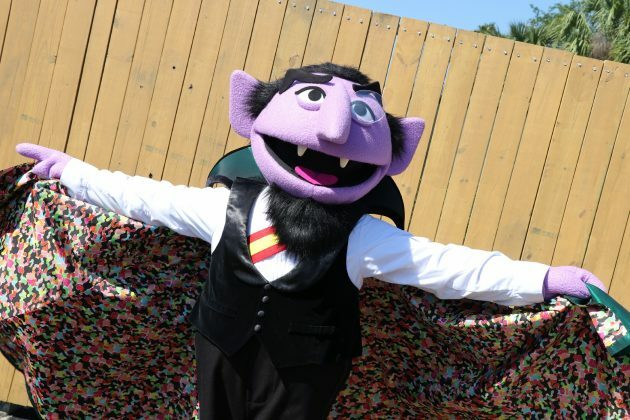 We hope that this is the first steps of bringing Sesame Street to the Orlando park, as a new dark ride would really put the area into another level of awesome. 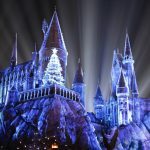 The interactive wand that unlocks hidden secrets and special effects.